Steampunk fairy by Guild of Harmony. Way too much fiddly details on there to suit my taste, but the sculpt itself is very impressive. Jabba the Hutt by Knight Models. 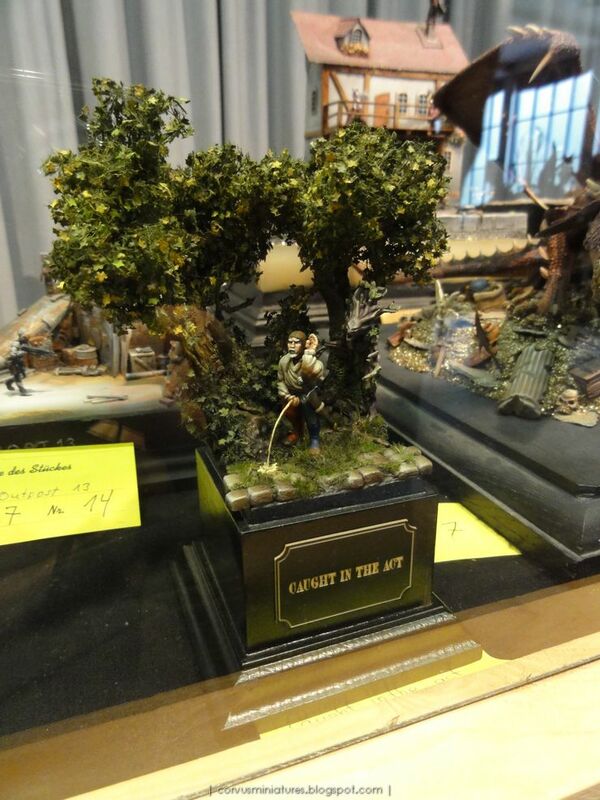 Not something I'd buy because of the scale (70mm) but still a breathtaking piece! 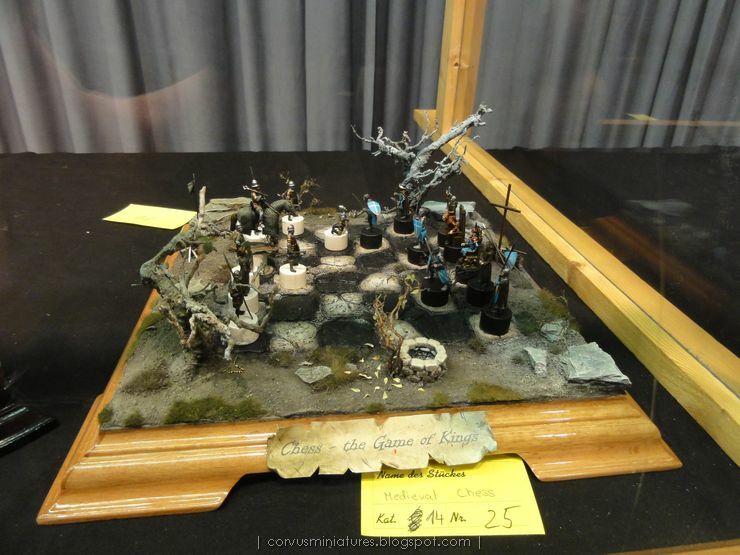 Impressive Kingdom Death conversion on a truly unique base concept, by SuoU. Black Templar squad by Flameon. Khador Army in 300 style. Abandoned Chinese theme park "Wonderland". Industrial Decay Network: a collection of artistic pictures made inside old factories etc. What a joy to paint! That's Nurbald the Sculptor by Rackham. Gorgeous figure, a real joy to paint. I decided to paint the legs separately, you can see them mounted on the left of the picture. 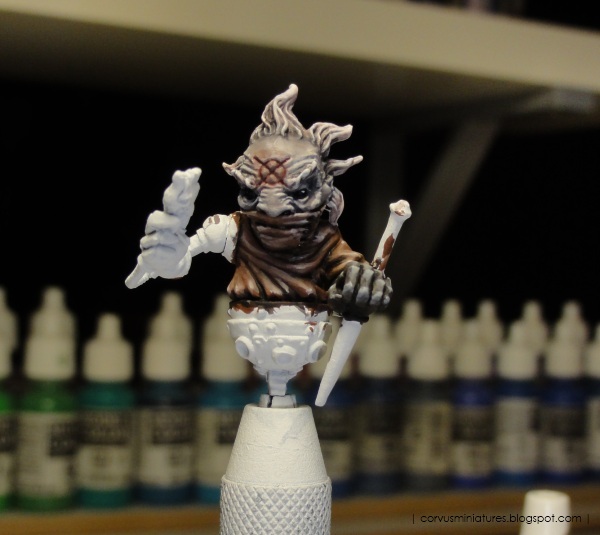 I superglued them on toothpicks for easy painting. 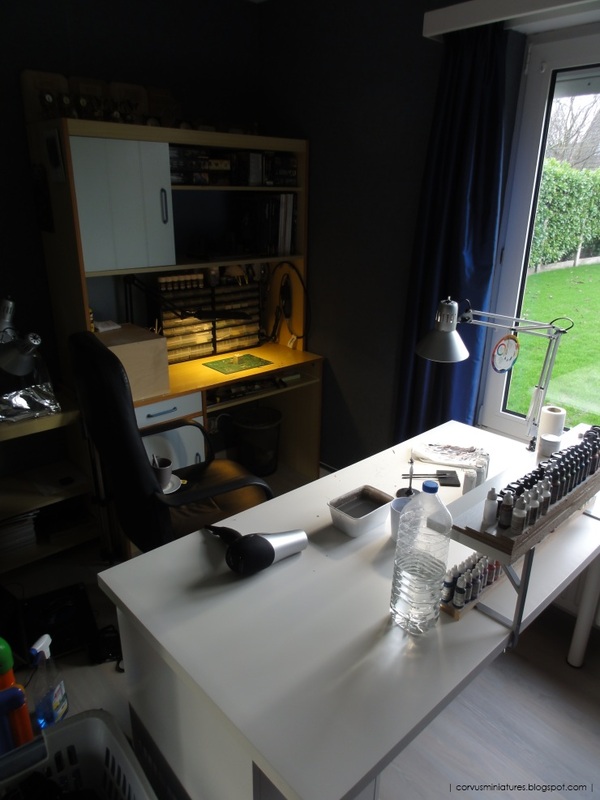 Here's an overview of the hobby area, on the left you can see a bit of my photo studio and next to it is my display cabinet, which is not shown on the picture. After my last complaint (read all about it in part 2 of my story) I got promised by GW customer service that before sending another replacement to me, it would be inspected by someone from QA (isn't that their job?) and another person from customer services. My first reaction was probably the same as yours. 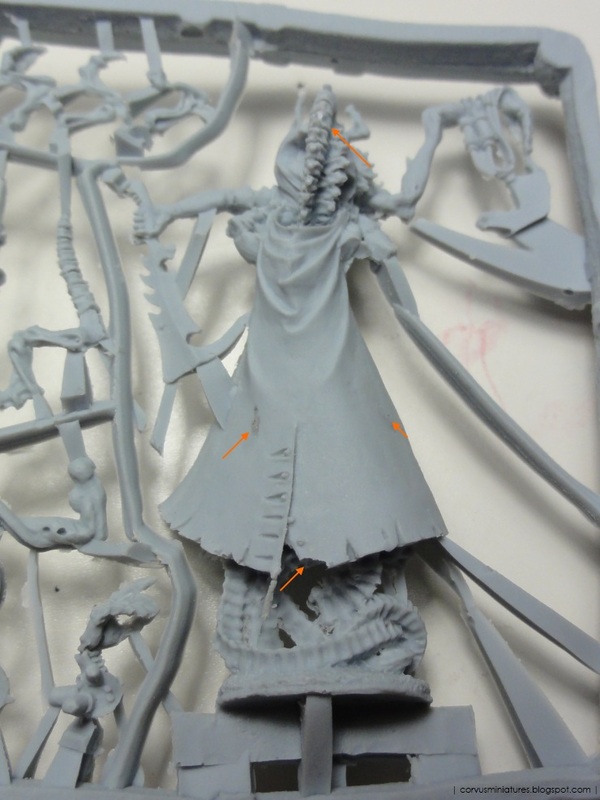 How can a figure without a head get through QA???? But then I took a closer look at the envelope, and the head was in there. The blister was opened, so there had been an inspection for sure. But the contents of the envelope got severely battered during shipping. There were a lot of indentation marks on the blister plastic, the paper inlay was even ripped where the head was, so this envelope was probably placed at the bottom of a pile. Besides the head one of the "antenna thingies" on top of the figure also broke of. 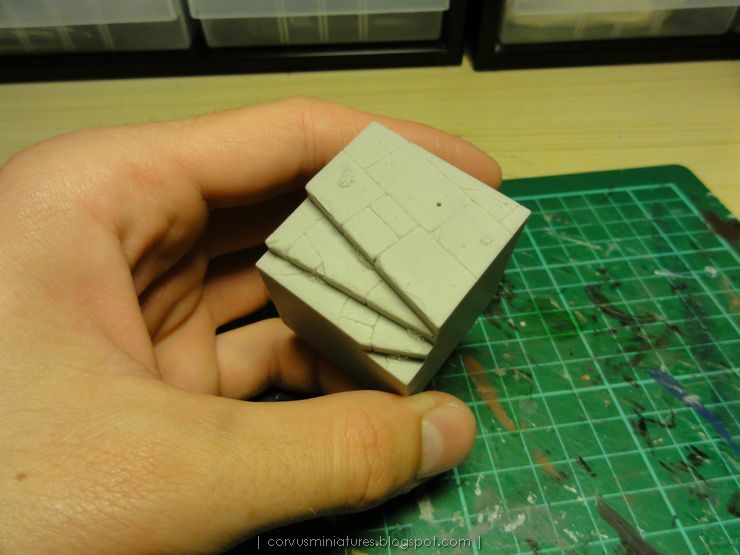 Good idea to ship this in an envelope GW! Time to check out the casting quality. 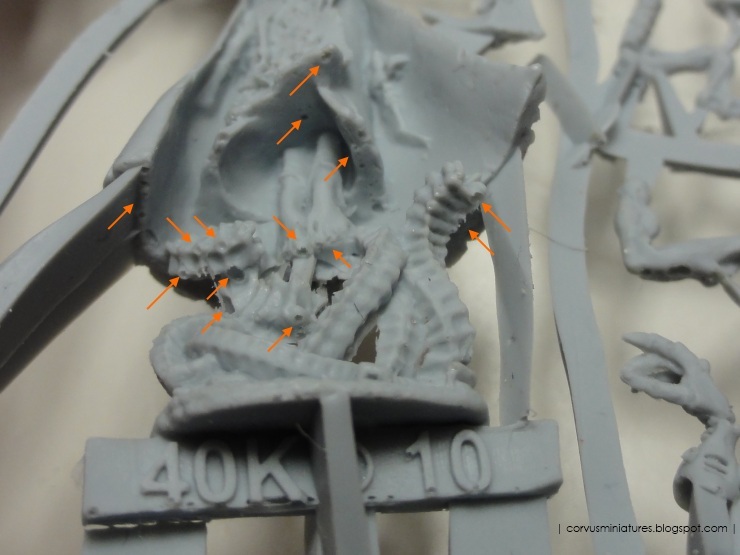 The areas which were really problematic on the previous two figures looked okay now: the chest area and the worms on the base didn't have a bubble on the tip of every pointy bit. But a further inspection quickly revealed several big bubbles on the arms. The hair also was damaged by bubbles. 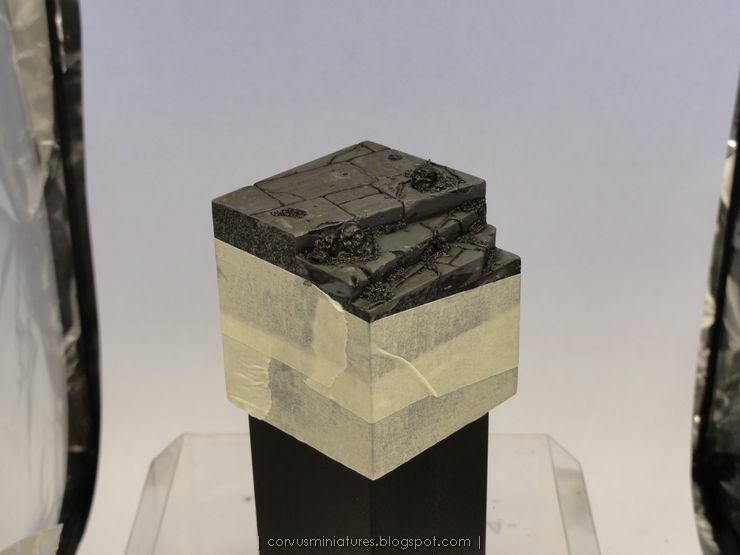 Two other major defects included a part of the base being evaporated by a big bubble, and one of the vials on the mechanical hand having a similar problem. The cloak had two identical problems to the previous figure: the cloak which is very thin in places, and the corner near the bottom suffering from a bubble. The spine area on the back was also severely damaged during shipping. 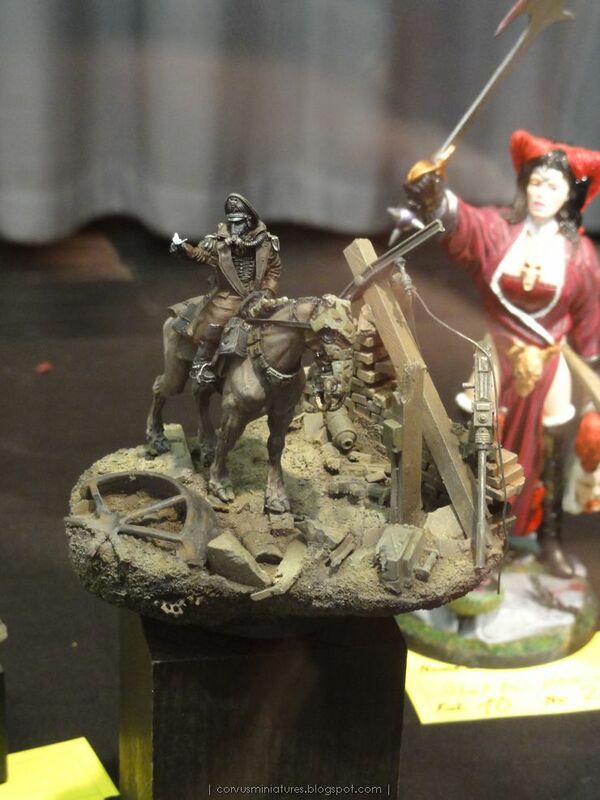 This figure also had a small bit of mold material on it, which you might have read about elsewhere. It was hard to picture since it was in one of the recesses in which an arm should be glued, but it appeared as a small pink speck. I have decided not to ask for a replacement this time. I think I've seen enough of this product to get a good image of its quality. And with this last one they made two very severe errors: bad packaging and sending me a figure with obvious flaws while promising to send a perfect one. I'm now going to try to get my money back, but I'm afraid the only thing I will get back is a voucher of some sort. I'll keep you guys up to date! 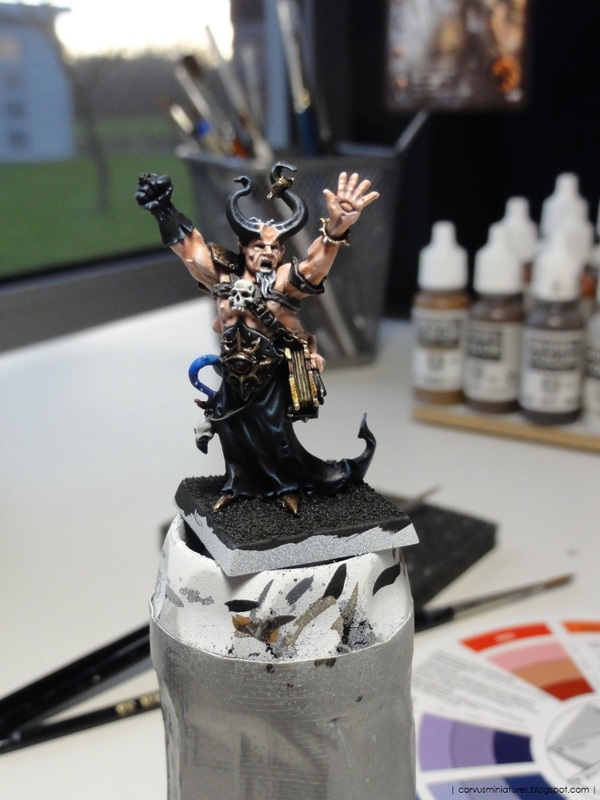 The Chaos sorcerer is almost done. Working on the metallics now. Metallics aren't my strong point, I'm happy about what I did on the shoulder guard, but the metallic symbol on the belly plate lacks contrast.... might get back there and mix in some non-metallic colors, such as light grey. 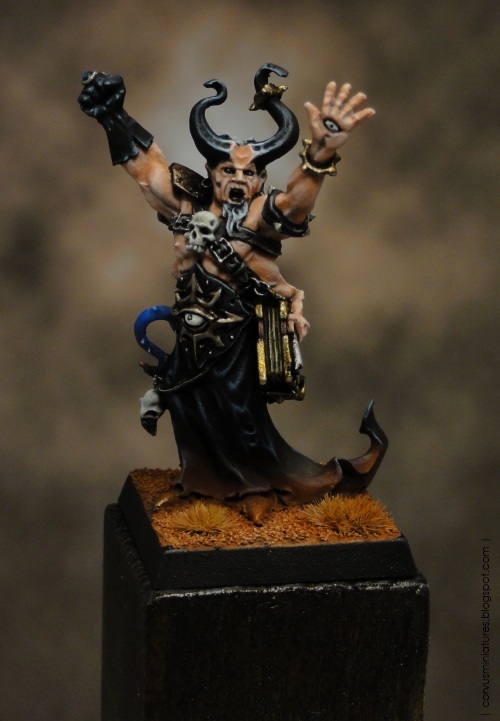 With the Chaos Sorcerer I'm not sure what I'll do next. My initial plan was to paint some more GW minis, but my experiences so far with the Finecast rubbish I have received will probably decide different. I also want to keep my schedule free for some upcoming projects, of which I can't say anything right now. 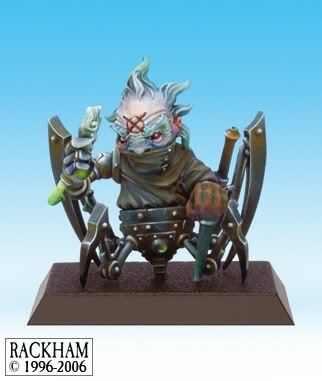 by the way if you're a fan of the classic Rackahm line, I discovered the following site: listing every single release: http://rackhamminiatures.yolasite.com/. As written at the end of part 1, I asked for a replacement. It was sent out right away and I received it in about a week. I still had some hope left to get an error-free model this time, but it turned out otherwise. In general this model has more problems on it than the previous one. When putting them next to each other I immediately noticed number two had some deformation issues. The face looks different, much more slim than the previous one. The arm is also bent in a strange way, and the two tentacles above his head look completely different. The first model had a lot of bubbles in the chest area, this one had exactly the same mistakes. There's also a big lump of flash on his chin. The mechanical arm has bubbles in exactly the same spot as the first model, together with some more bubbles a bit higher up. In general the lower part of the model has less bubbles, but the toe still had the same problem. 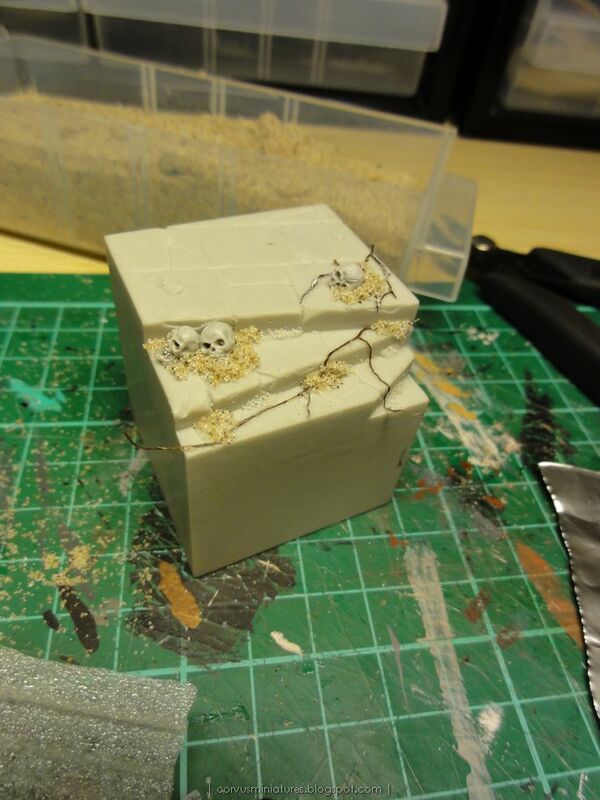 I also noticed some additional channels between the worms on the base. 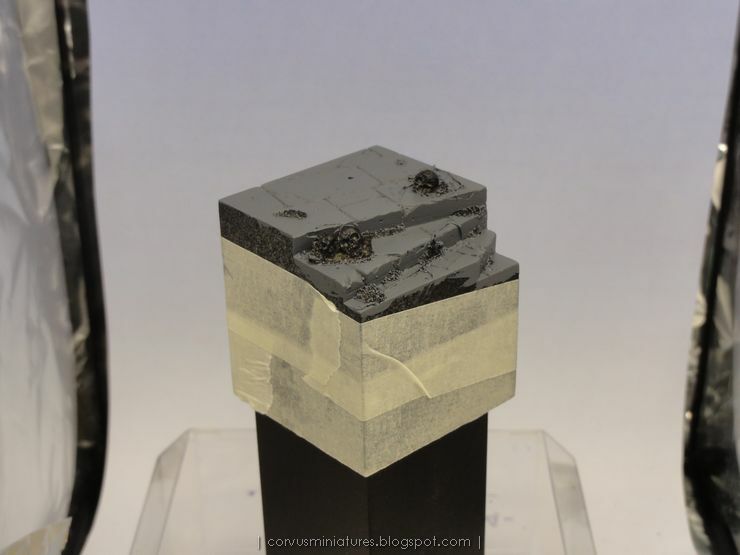 Speaking of the base: there's a part missing, caused by a bubble. 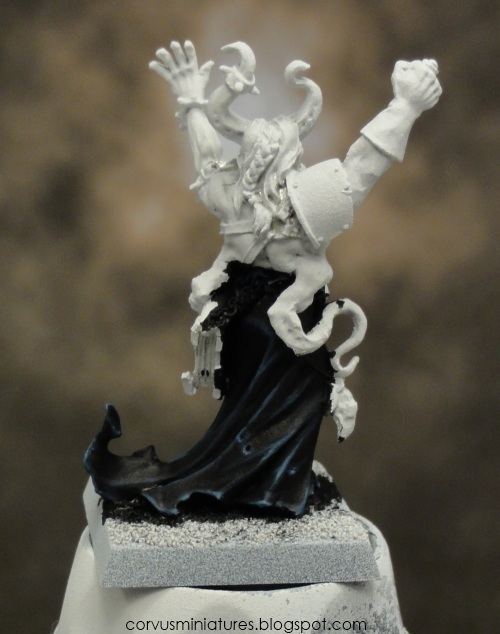 The cloak is probably the worst part of the miniature. It's so thin it's translucent in places, and on two occasions a hole formed. The spine normally has some spines running along it, but halfway these are simply missing. 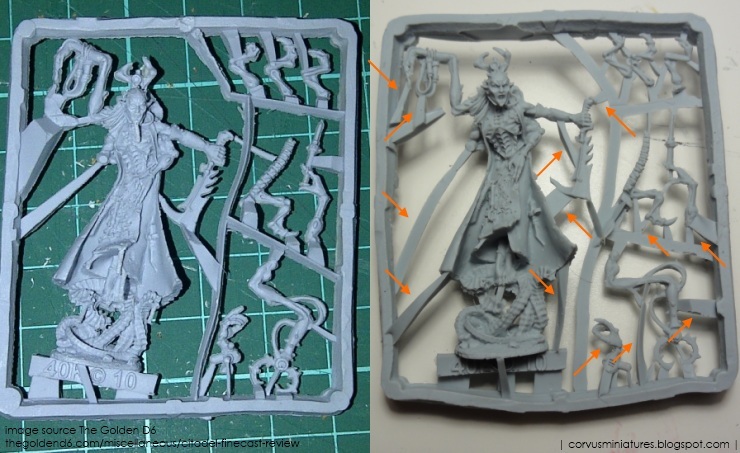 What really struck me is the difference between the first and the second sprue. 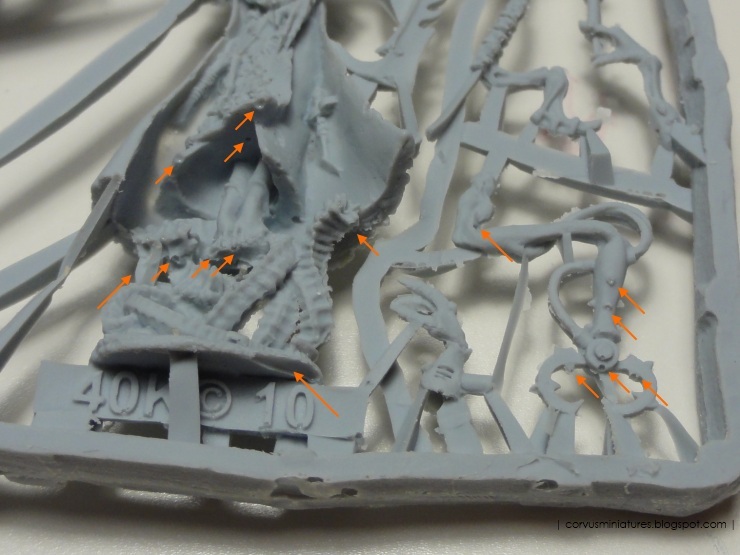 I also noticed some errors on the first sprue, like the weapon which is missing a large part. But in general the channels are laid out completely different. 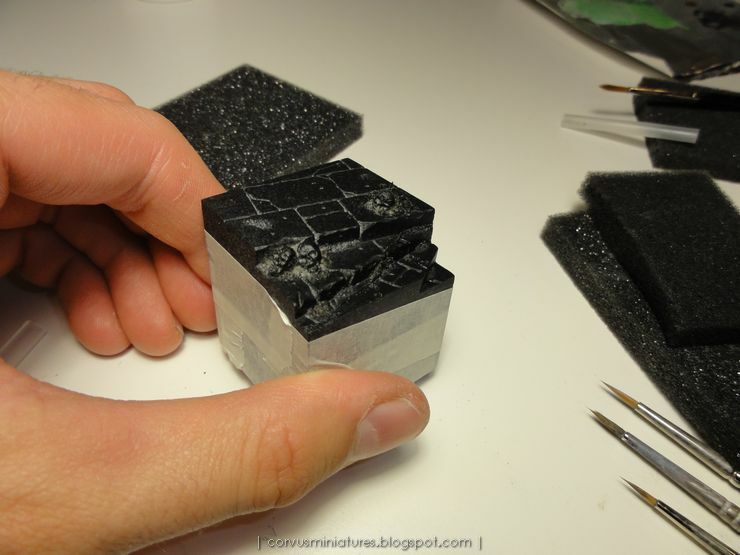 How can you achieve a consistent quality when all of the molds are different? Firstly I want to apologise that the replacement model you received was once again faulty. I have requested another Urien Rakarth for you, that both me (and the rest of the customer service team) and the Quality Control Manager will check before we send it out to you. Again apologies and we will let you know immediately when we have a model we are satisfied with to send out to you. I expect them to return a flawless model now, nothing less. If that isn't the case I'll ask for a refund. 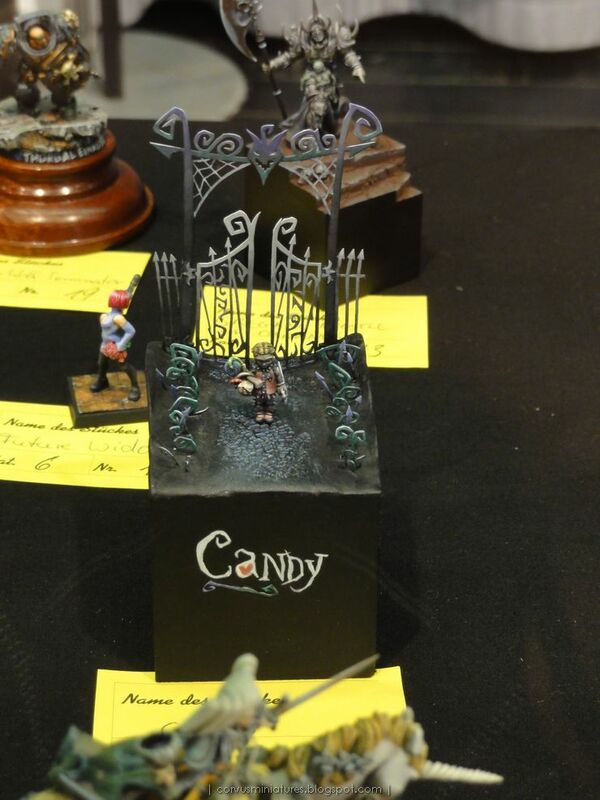 Entering a commissioned piece in a GD competition, more an "epic fail" than a "best of", but it happened in Australia. 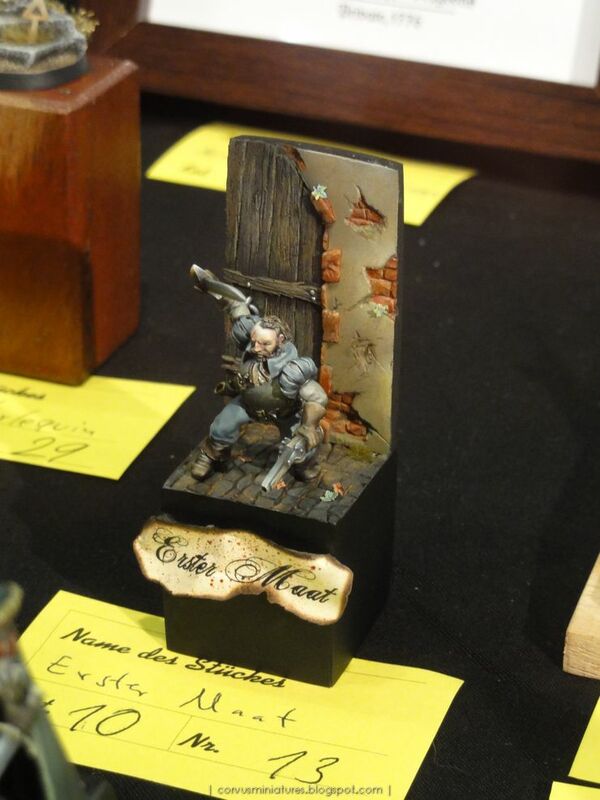 Amazing freehand work explained by Stephan Rath (derwish). 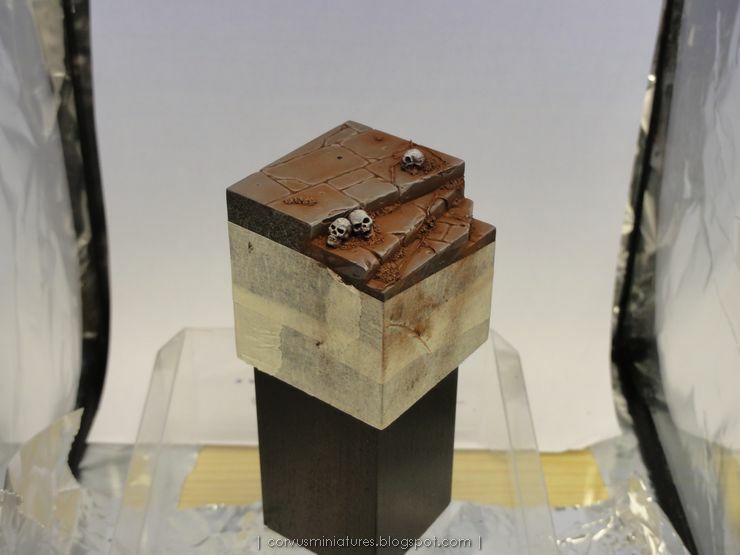 A great tutorial on how to paint metallics, not new, but found it recently and it's really something I wanted to share. 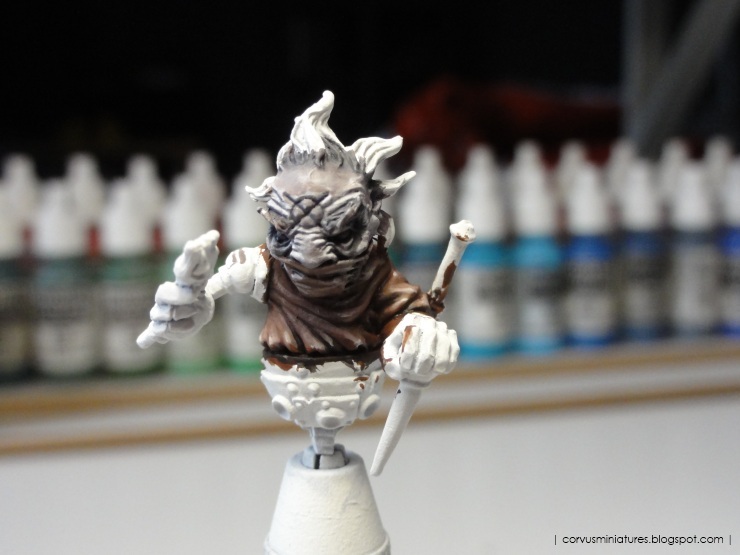 Step by step guide on how to paint the Steam Guardian Rackham classic. 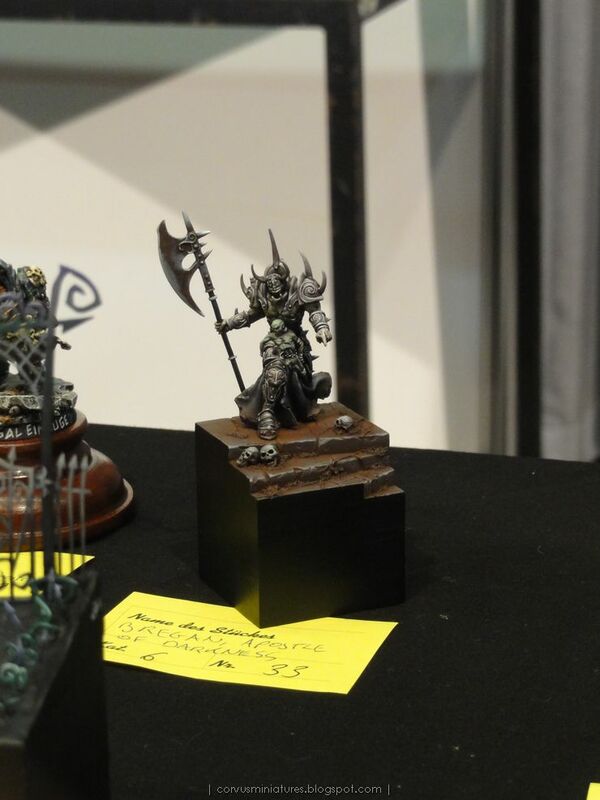 Abyssal Warlord by SCALE75. 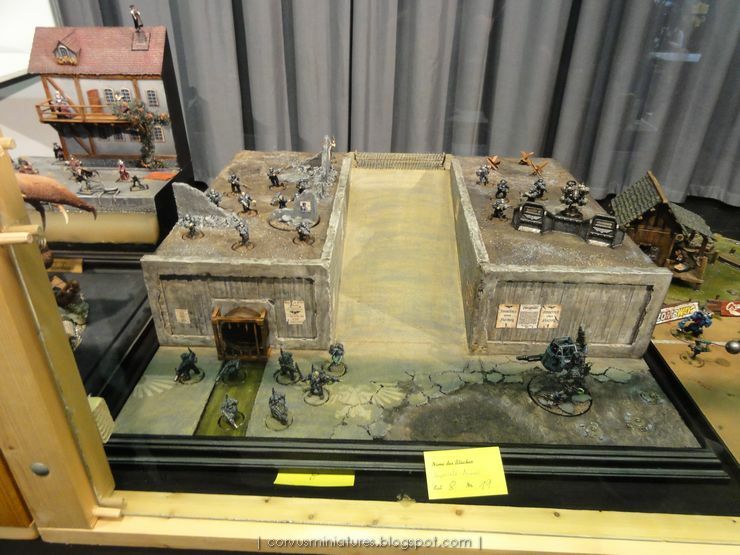 I'm not into larger scale models, but this one is pretty awesome. Chaos Sorcerer by AlexiZ. Be sure to watch in HD. 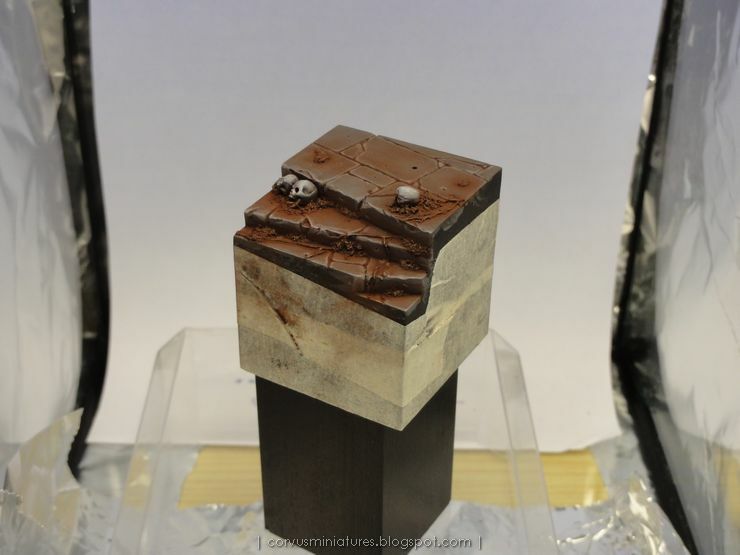 Arjac Rockfist by razza (Darren Latham), a paintjob bordering on perfection. 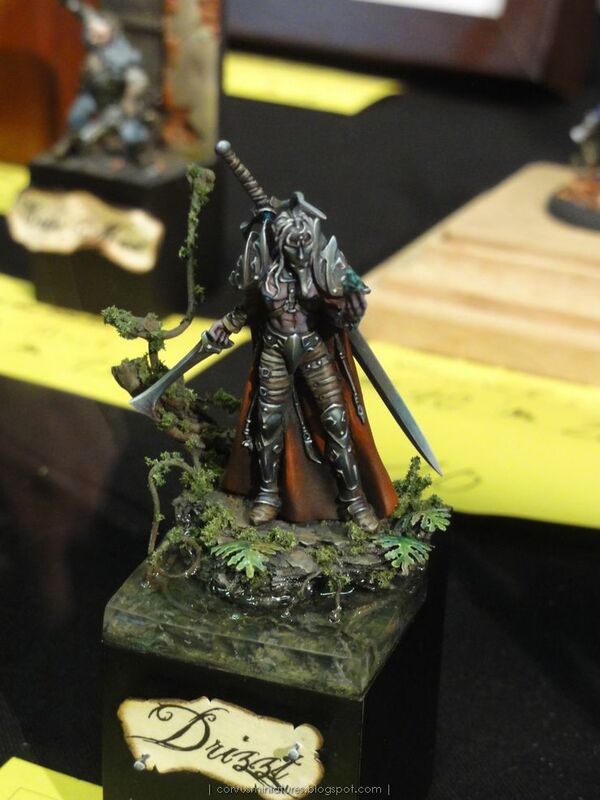 Lord Carver by Piranha, not a fan of the sculpt, but the NMM on it is really amazing. First of all thanks to everyone who provided their feedback in the previous post and also on the Chest of Colors forum where we have a thread running on the subject. 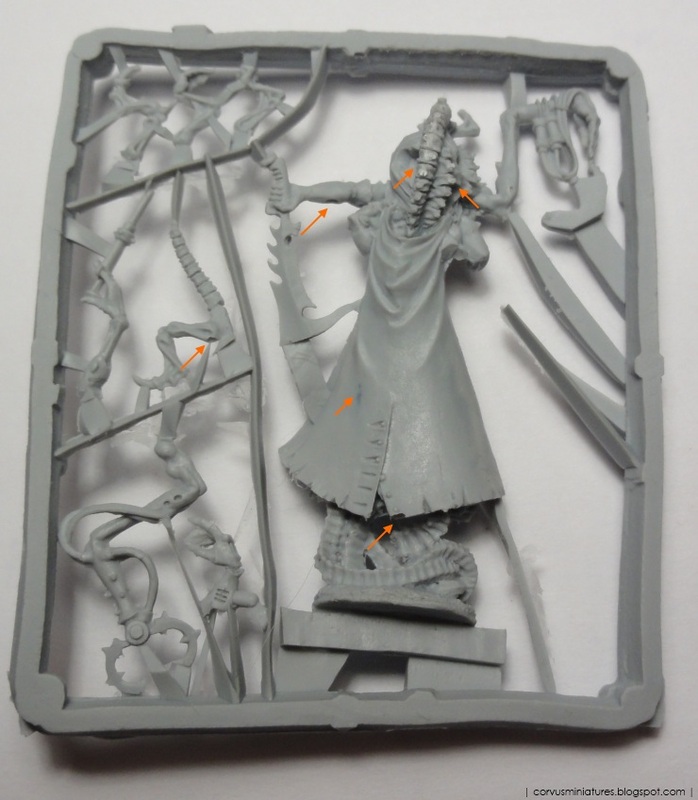 I decided to buy my Finecast (Urien Rakarth of the Dark Eldar) in the official GW online store. Besides Games Day tickets I never bought anything there, but stories about the good customer service (vital when buying Finecast) made me do my purchase there. Since I live in Belgium, shipping is free for every order above 15 EUR. So I bought Urien Rakarth and a bottle of Liquid Green Stuff. I placed my order on a Thursday and the package already arrived on the next Monday! Since I was out of the office (I always make packages ship there) last week I only had time to pick up the package on Friday. Unfortunately I had to leave immediately for work again so I only had the time to briefly study the figure while in the blister. At first glance it looked quite good. 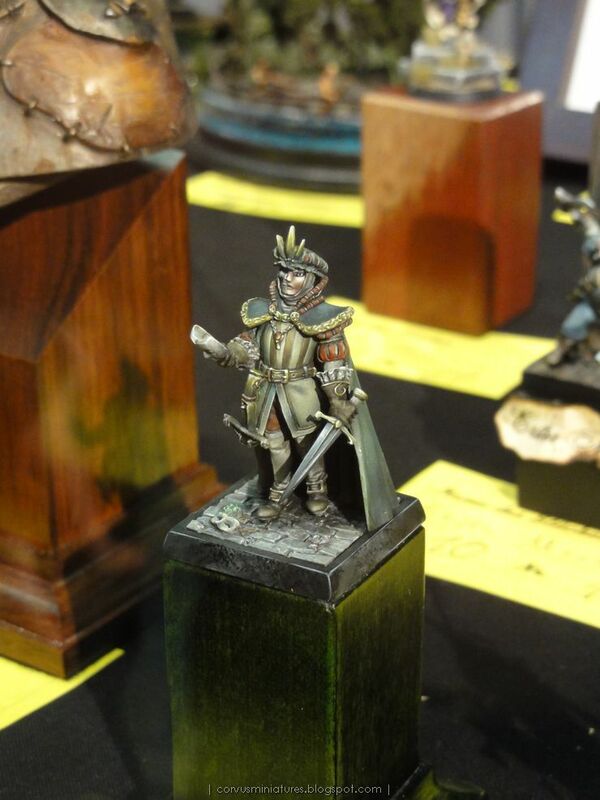 Crisp details, some mold lines but nothing more than on a metal miniature. There are a lot of "canals" attached to the parts, some of them quite big and in difficult places. For example the one attached to the fingers on the top left part. I also noticed some damage caused by air bubbles on the mechanical part on the bottom right. After reading all the horror stories about Finecast on the internet I must admit it is difficult to remain unbiased. 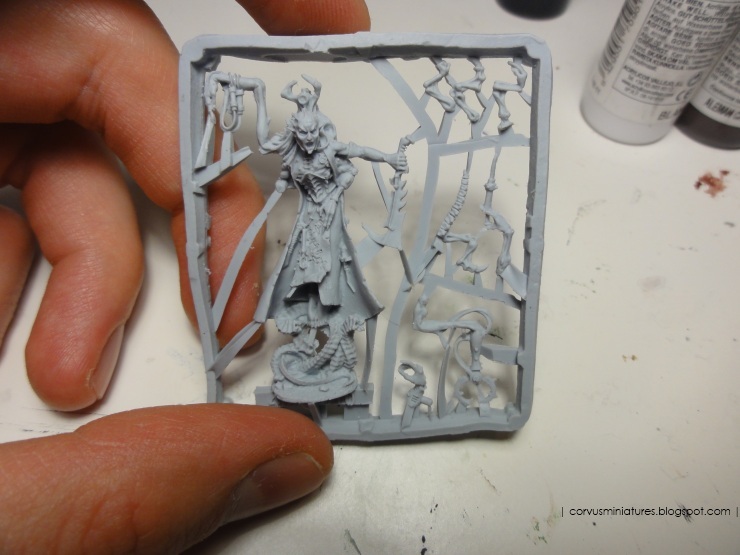 But there are reports on the web of perfectly cast figures, although they are rare (probably because people are more inclined to criticize GW than to praise them). I also found it hard to believe that a company that big keeps on selling a defunct product without making radical changes to the quality. Sending out replacements means a huge cost, right? 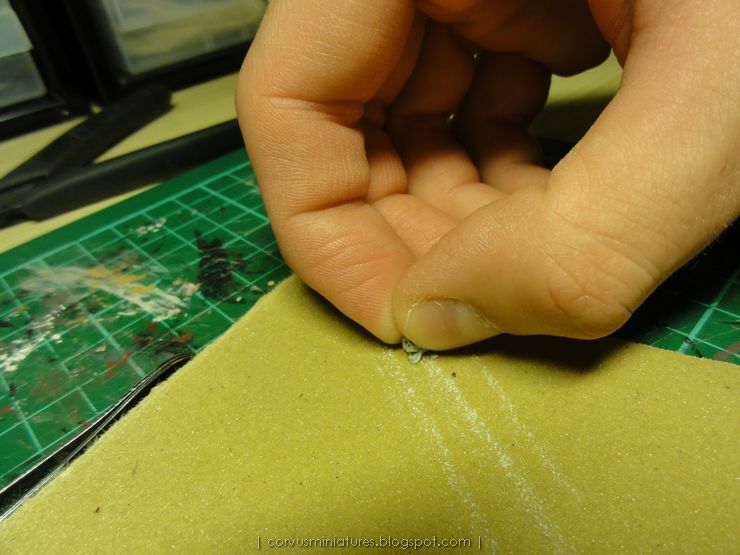 As a hobbyist I accept that some preparation work is needed: removing mold lines, filling gaps after attaching pieces. It's part of the hobby after all. 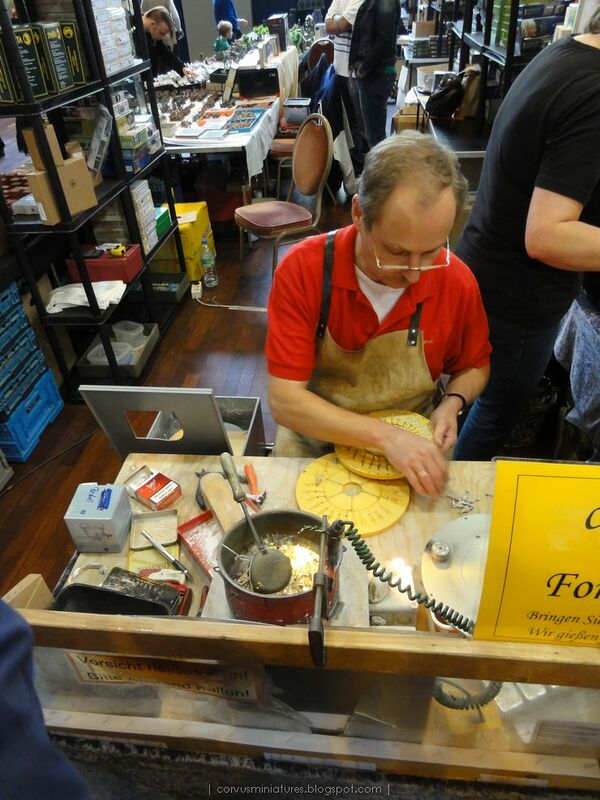 But sometimes a figure has something that needs repairing. 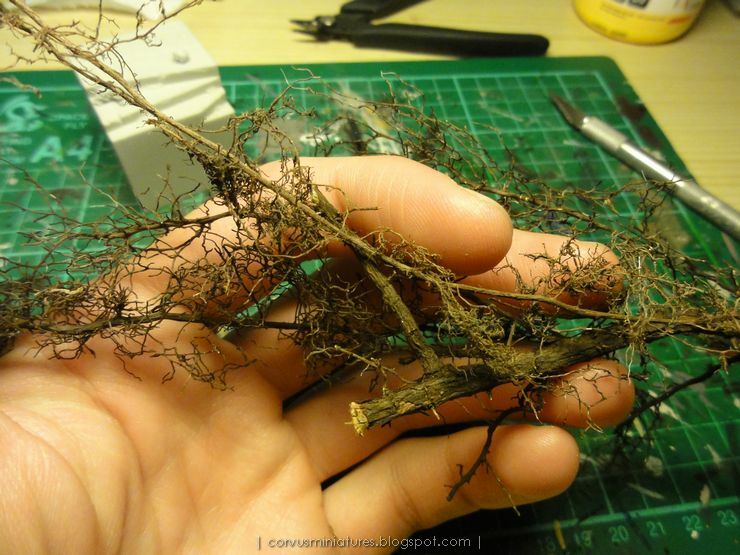 This means, large gaps, missing parts, in other words something which needs sculpting instead of simply filling with a single layer of milliput or green stuff. Seeing these bubbles, although small, was enough for me to think of this figure as unusable. The bubbles in the arms could be repaired, but the pointy bits on the belly area are another thing. Instead of ending in a point there was a hole created by a bubble. Also, the line running horizontally across the chest was also affected by a bubble, separating it in two. Nearly impossible to repair that in my opinion. The bottom of the joint was affected by bubbles, on both sides, and the inside of the gripper also had damage. 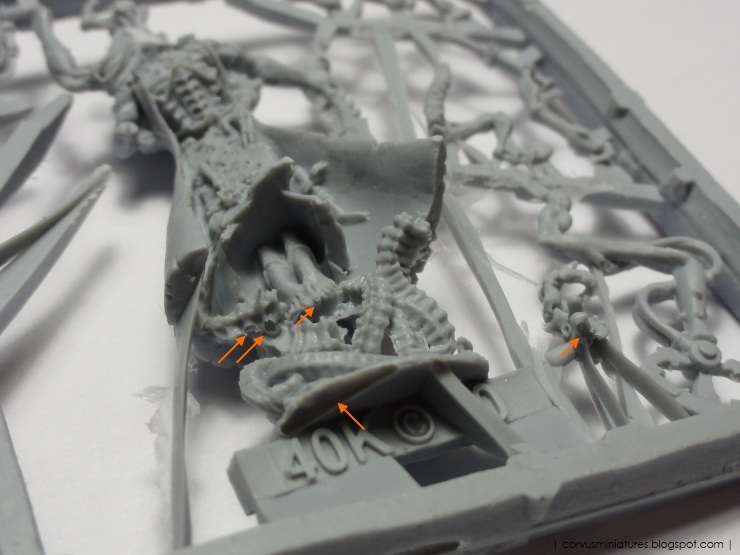 But the same part has the worst damage of the entire sprue: the elbow of the arm. A huge bubble was there, together with some smaller ones, also damaging the part where the tubes entered the arm, something really tough to repair. 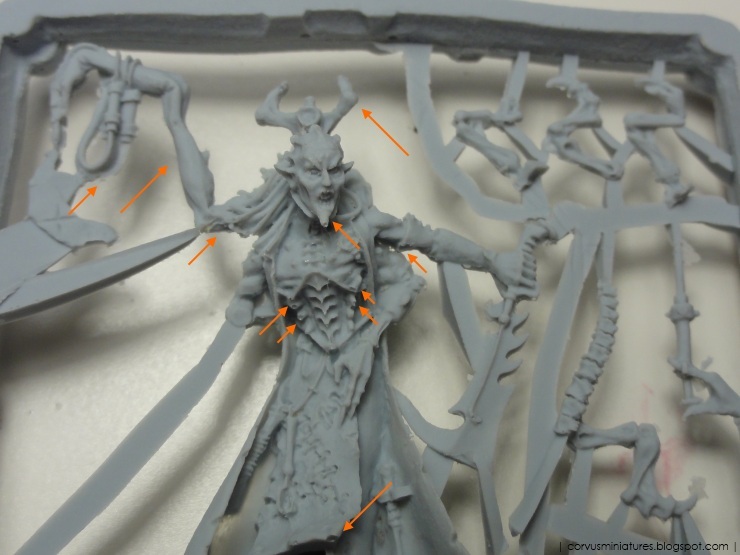 Lots of small bubbles here, the underside of the cloth, the toes, ... but most importantly the "worm" things on the base. These also have pointy bits along their shape, most of the ending in a bubble hole instead of a point. 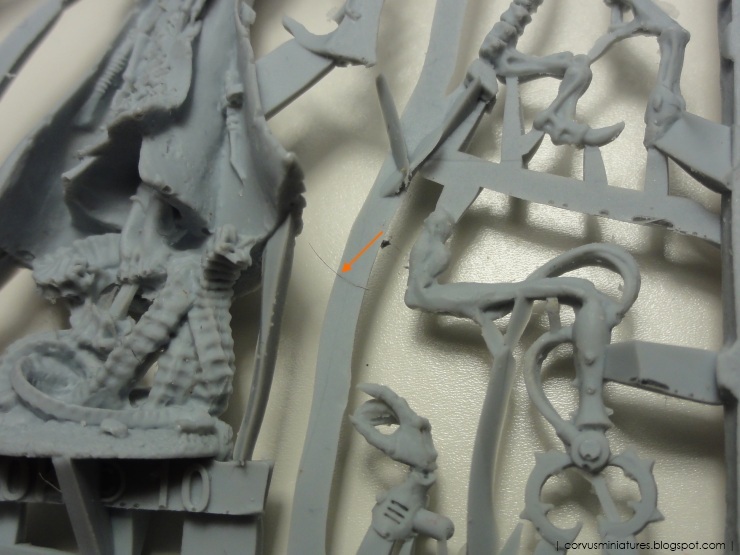 Not sure if it's a human hair or not, but things like this don't belong in a sprue. 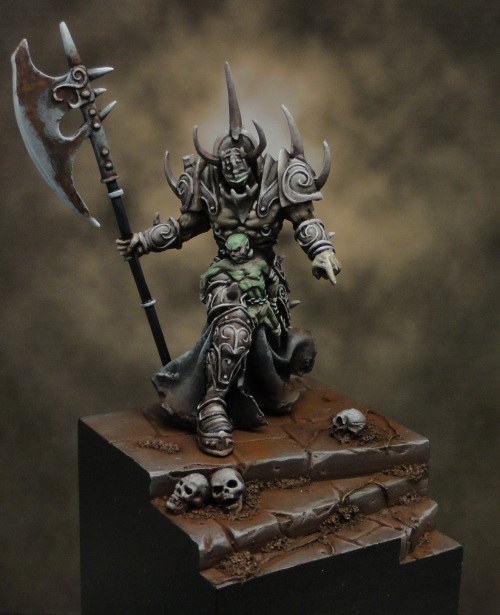 Hi Gerrie I am sorry to hear you are having problems with the Urien Rakarth model you purchased. 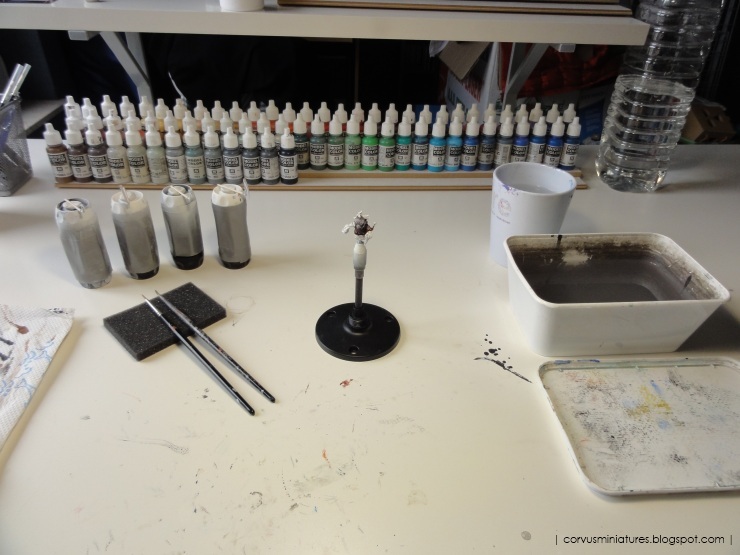 At Games Workshop we strive to ensure that all of our products reach you in the best possible condition, unfortunately a few mis-packed products do slip through our tight quality control checks. We will be happy to offer either a replacement or a refund for the faulty model. If you reply to this email to let us know which you would prefer then we will action that for you. 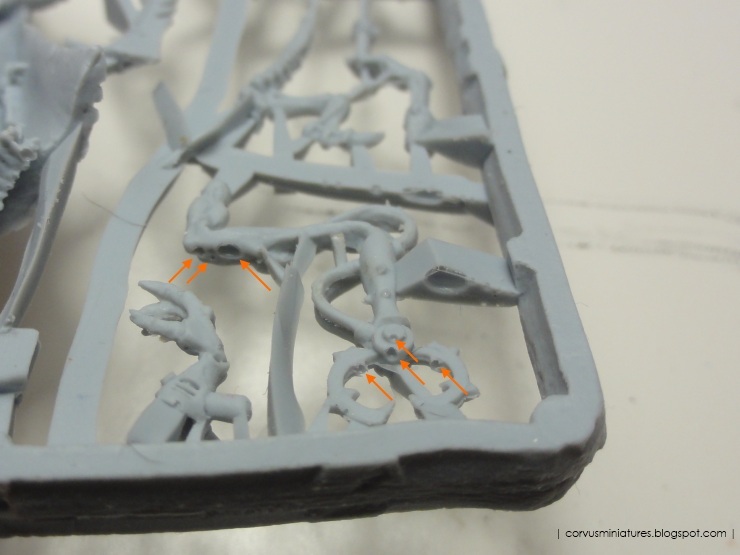 We would also very much appreciate it if you could send in some photo’s of the miscast model, as we can pass these onto our manufacturing team so that they can see the issues and implement steps to prevent this from happening again. We look forward to your response. For the time being I am going to play the naive customer... maybe I was unlucky to have received one of these "mis-packed products". So I asked for a replacement. 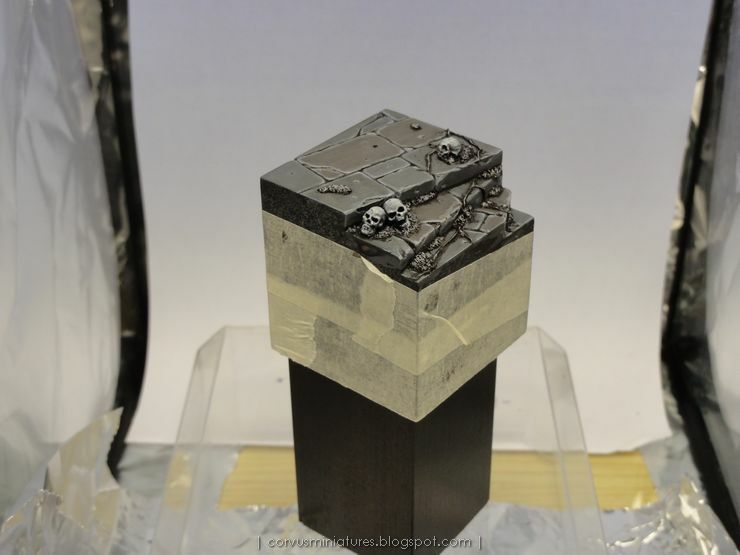 There's one last thing I want to show you, proof that GW is really doing something to improve the quality of this product. 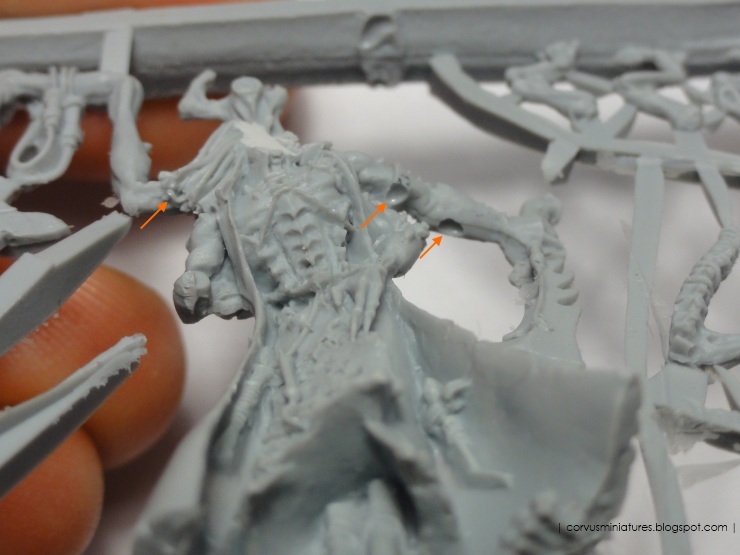 Recently I found a picture of Urien Rakarth in Finecast on the web, in a blog post of a happy Finecast customer, claiming to have received a perfect cast. I doubt this because I think it has a bubble on the mechanical arm joint just like figure did, but that's a different story. 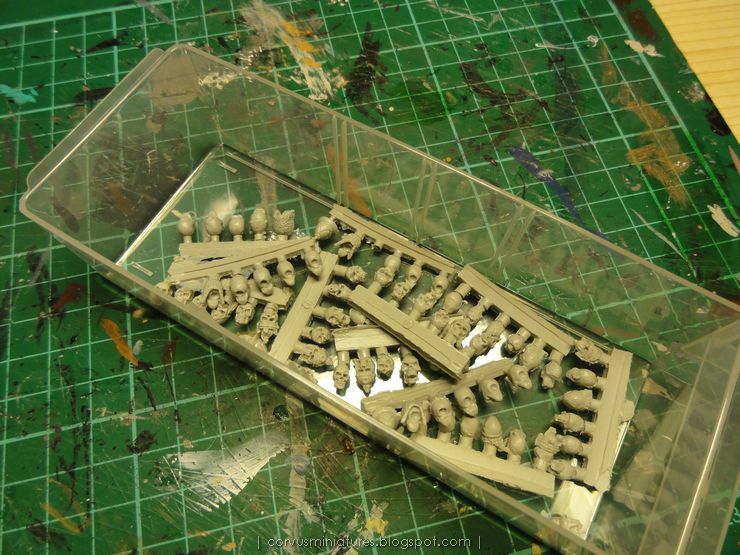 When comparing the two sprues you'll notice that mine has a lot more "canals". 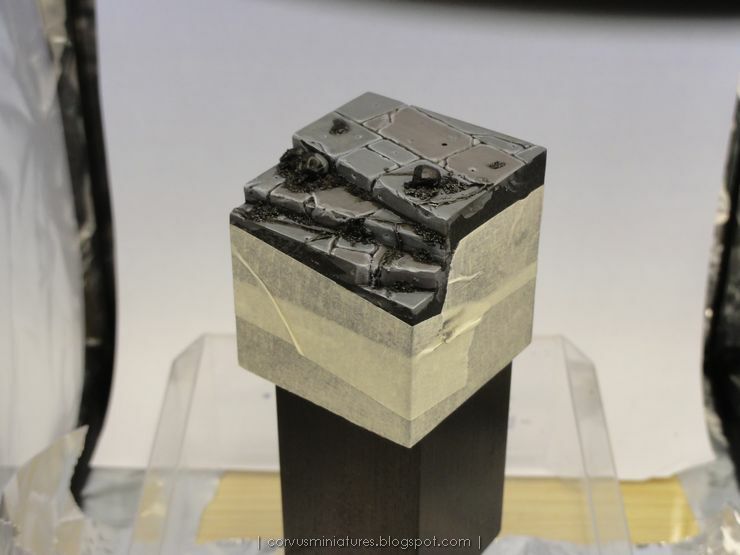 The picture on the left is made by The Golden D6. You can read more about their experiences here. Unfortunately this didn't help avoiding the bubbles. It also causes more work, and canals in more awkward places like the fingers. You'll also notice the had part on the bottom to have switched orientation. 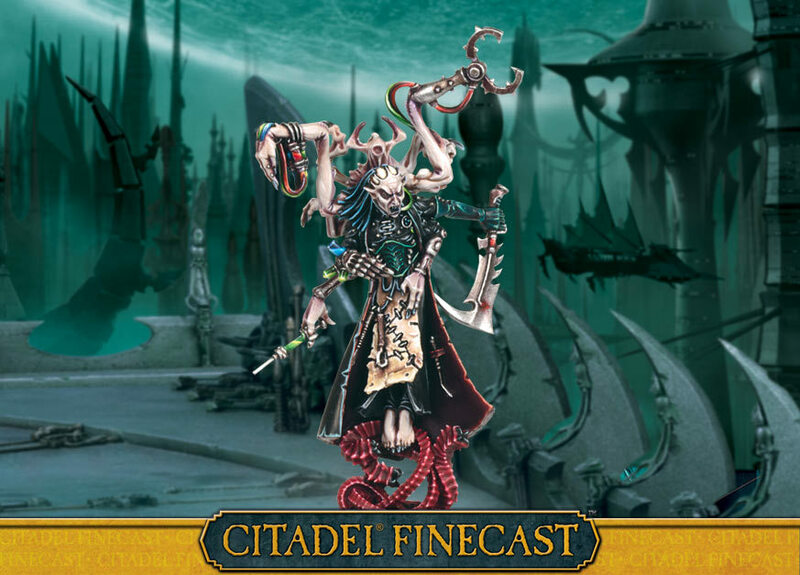 In the meantime I'm still curious in hearing your experiences with Finecast, either by posting a comment here, or taking part in the discussion on Chest of Colors. 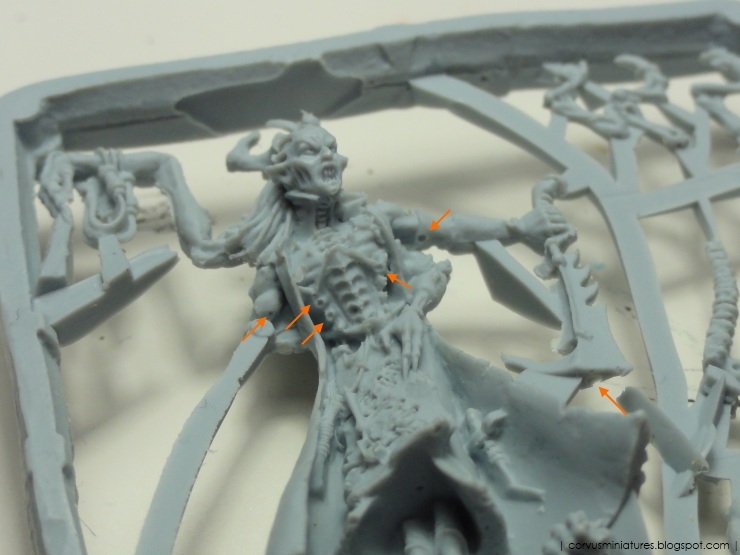 I'm still awaiting my first Finecast figure (I ordered Urien Rakarth last week and should be picking him up tomorrow), but as you all know there are plenty of (horror) stories around the web concerning Finecast. I started this thread on the Chest of Colors forums to point out some highs and lows. 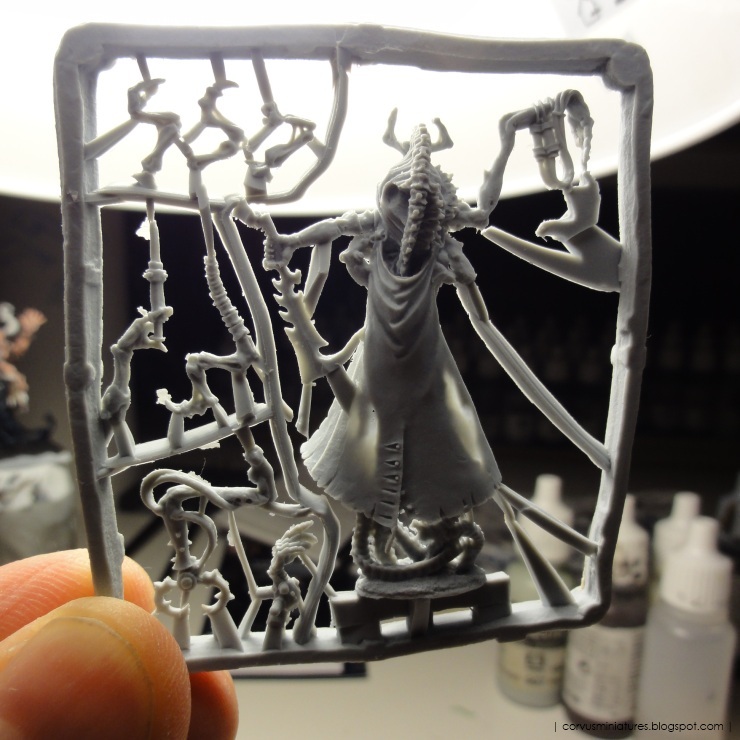 If you own a Finecast miniature and would like to share your experiences with it then I'd like to hear from you (by commenting). 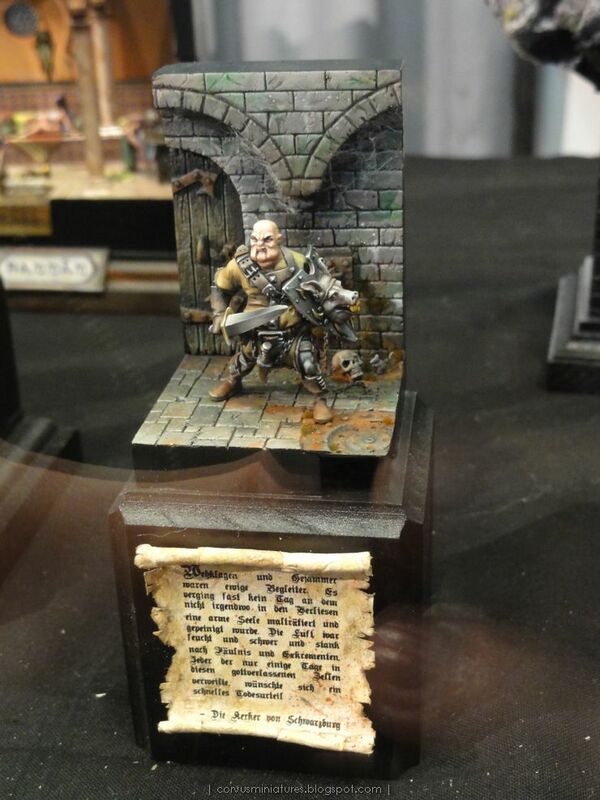 Anyhow you will get an update from me this weekend concerning my first Finecast purchase! Skintone is done. Really enjoyed doing the tentacle bit. It's actually the first time I painted a color transition like this, and I think it turned out great! 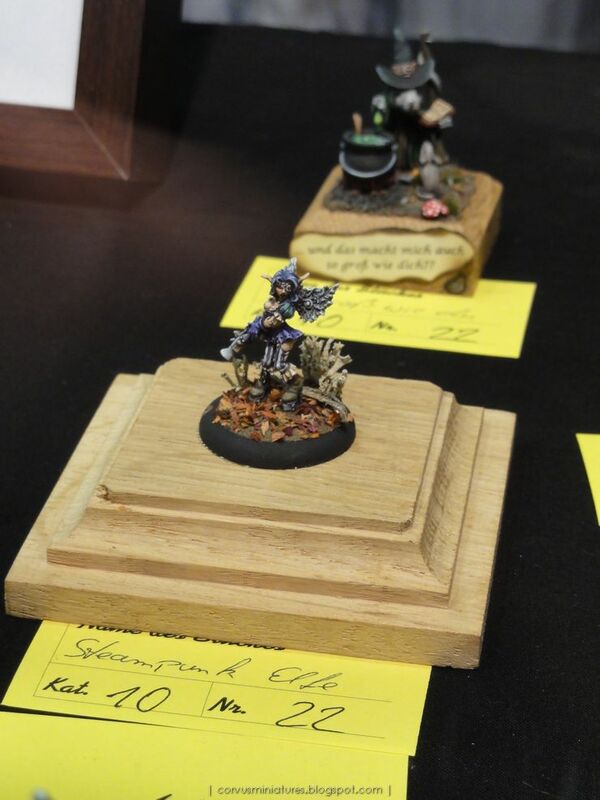 Good thing last month some winners from the UK Games Day decided to put their own pictures of their figures online, because GW's pictures didn't give a realistic view on the competition entries as usual. 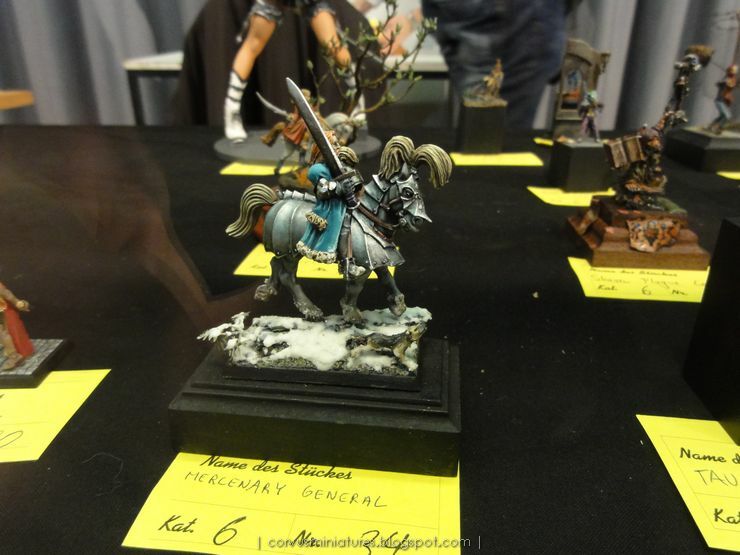 Another noteworthy competition was Hussar in Poland, and of course DUZI, of which you can read a report on this very blog. Space Girl by CoolMiniOrNot, limited edition goodness. 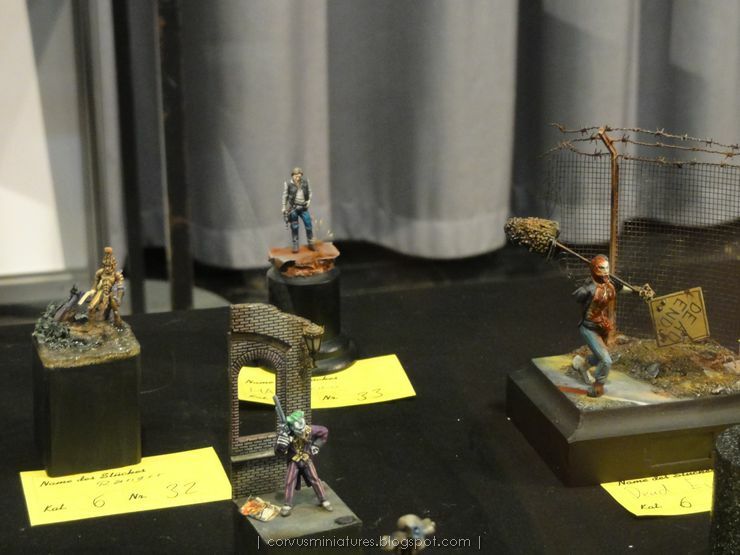 Red Box Games' zombies, awesome sculpts for a very fair price. Sometimes you are doubtful about a new product, but then you come along a good, clear review to take away the doubts. Looks like GW's liquid green stuff is quite useful in some areas. 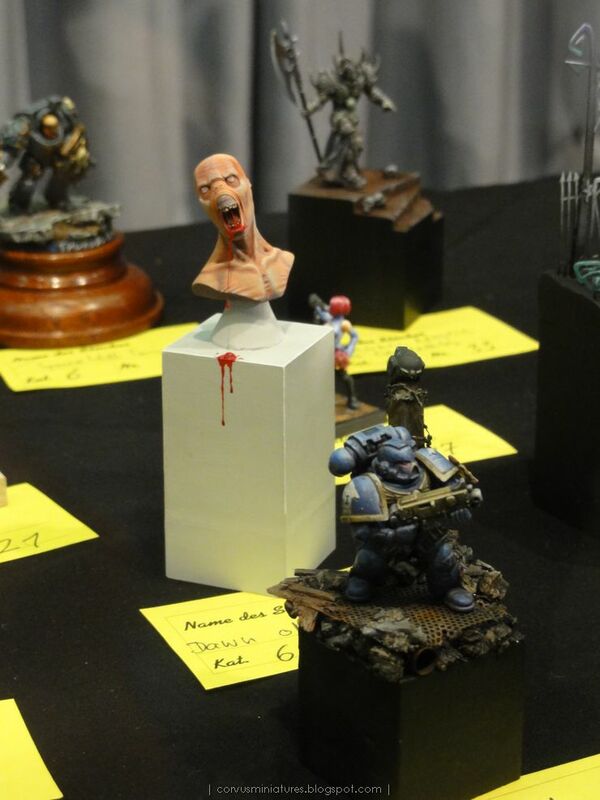 Steve Buddle's entry for the UK GD, that sculpted zombie cow should be made into a real model. Banshee by automaton, crazy checkerboard pattern! Faerie Wears Boots by Tooshy. 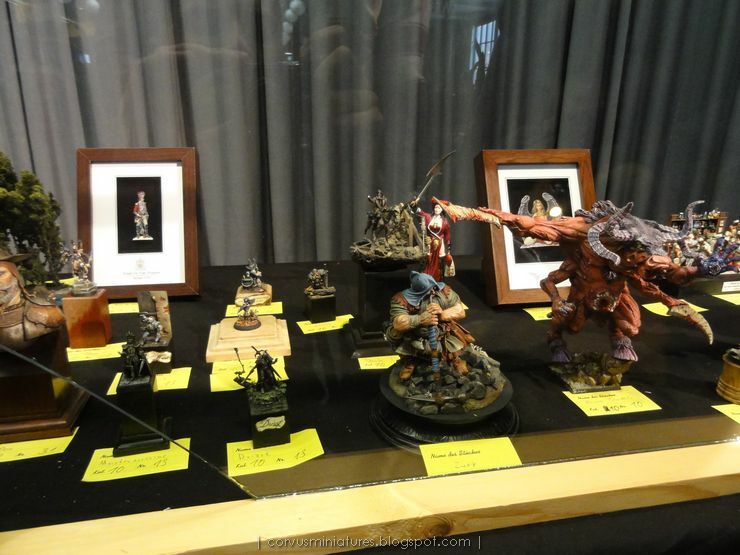 Overview of all 2011 Slayer Sword winners. France is my favorite, which one is yours? 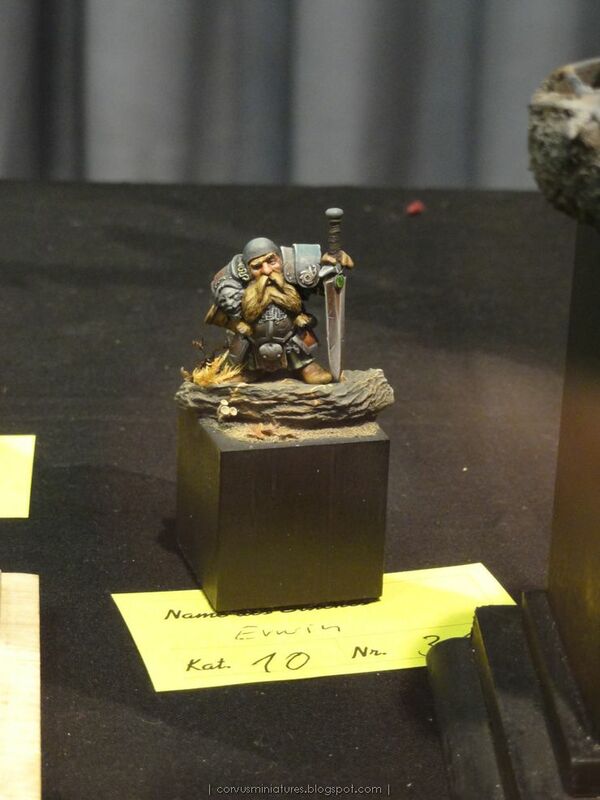 Luicien Sforza, new Infnity miniature painted by Angel Giraldez, one of his best works in my opinion. 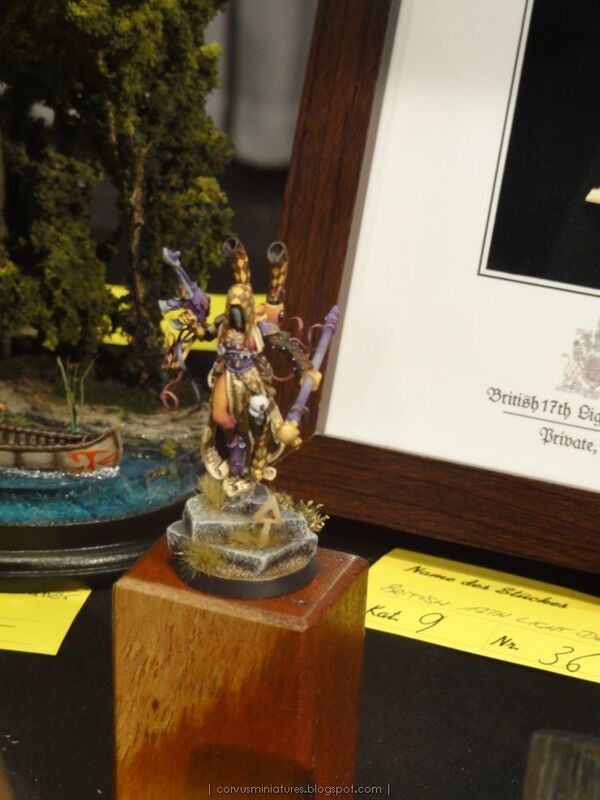 Hussar 2011 painting competition report, very serious competition painting going on in Poland. 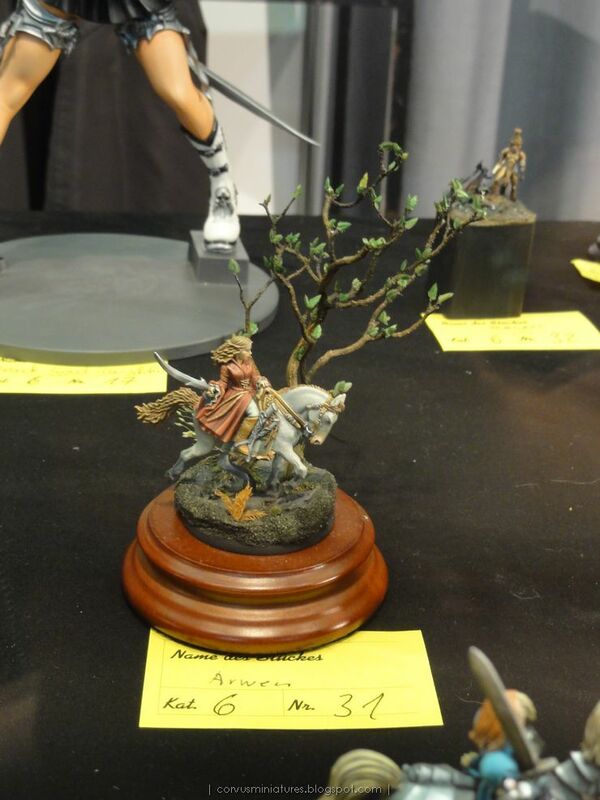 Speaking of Hussar 2011, here are some extra shots of the gold winner of the diorama category. As mentioned in my previous post, I'm in a creative, experimental mood these times. The Vanguard Trooper is far from done, but I'm eager to start working on a second miniature. This implies the chances of the Trooper getting finished soon have dropped quite a bit :) But I guess that's the price which have to be paid to quickly advance your techniques. 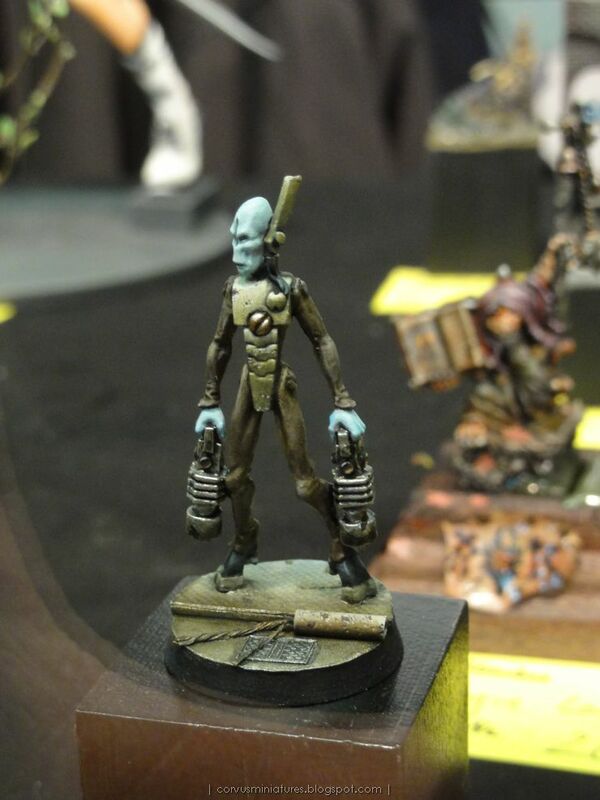 I've never been a big fan of Games Workshop's figures in general, and the way they are painted. 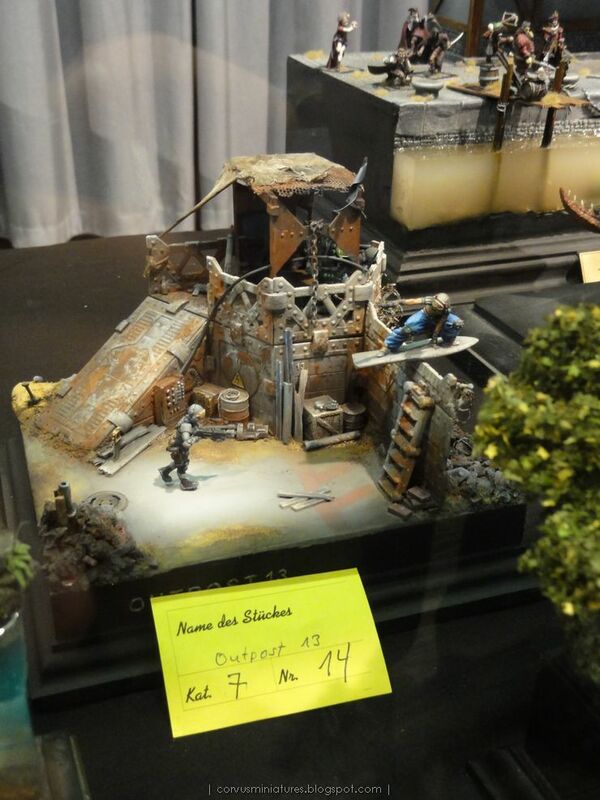 But I must admit that over the past year I really started to appreciate the studio paintjobs of their new releases. Especially the new Necrons and the latest Dark Eldar releases. They inspired me to give the 'Eavy Metal way of painting a try myself. 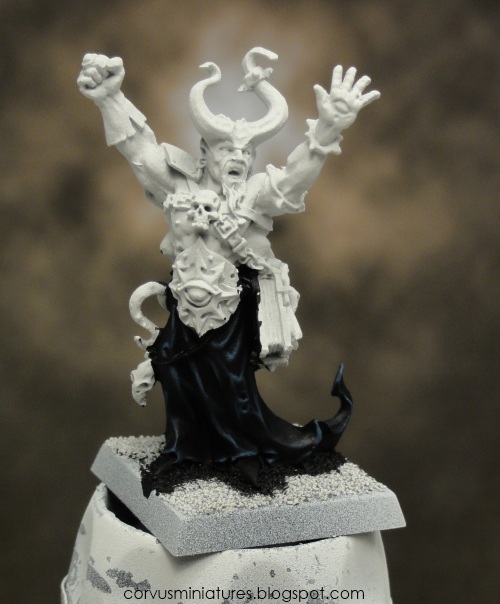 Last week I was on the brink of impulsively buying some GW minis to give this technique a try, but then I remembered I still have a perfect figure for this: the Games Day Chaos Sorcerer, a leftover from my trip to the 2010 German Games Day. Not much done so far, but I'm quite happy about the effect of the edge highlighting on the robe. With both Bregan done and the DUZI mission successfully completed it feels like some weight has fallen off my shoulders. Some weight I didn't know that was there until a few days ago. 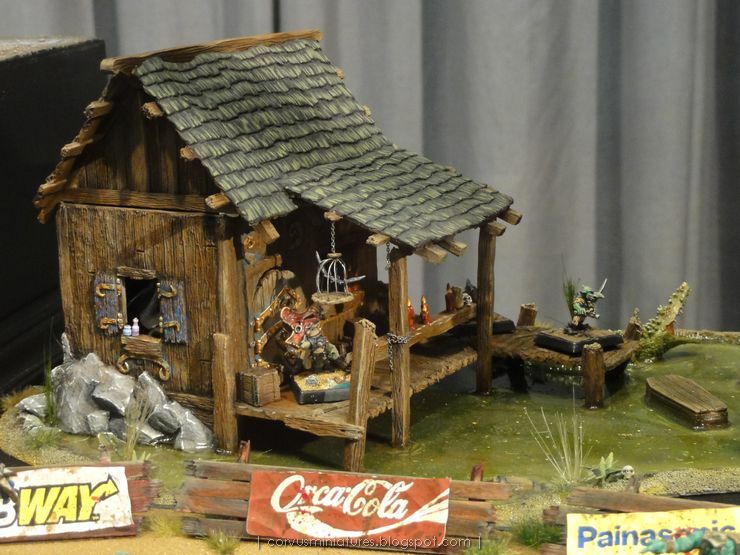 What I mean is that the need to deliver super high quality has made way for creative, casual and fun miniature painting. So work has continued on the Vanguard Trooper. Nothing top-notch, but I'm enjoying it. And even this low quality (call it good gaming quality :) is a good practice for the showcase quality stuff. 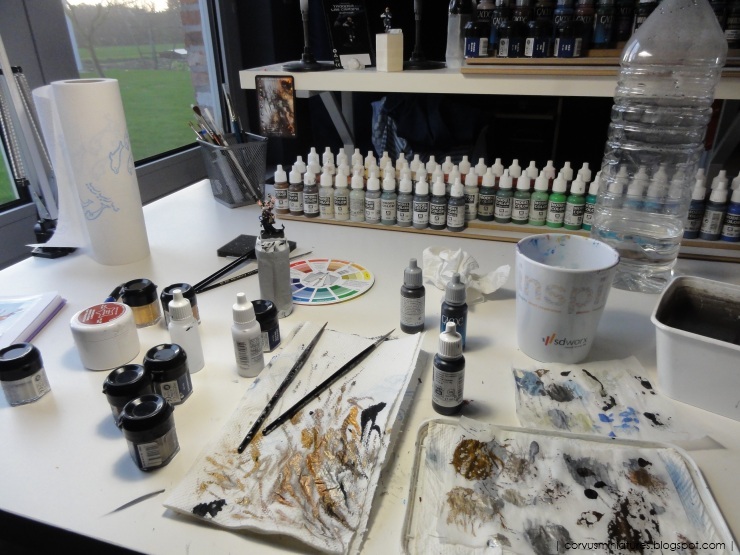 It allows me to try out new mixes and techniques without wasting too much time or a good miniature. 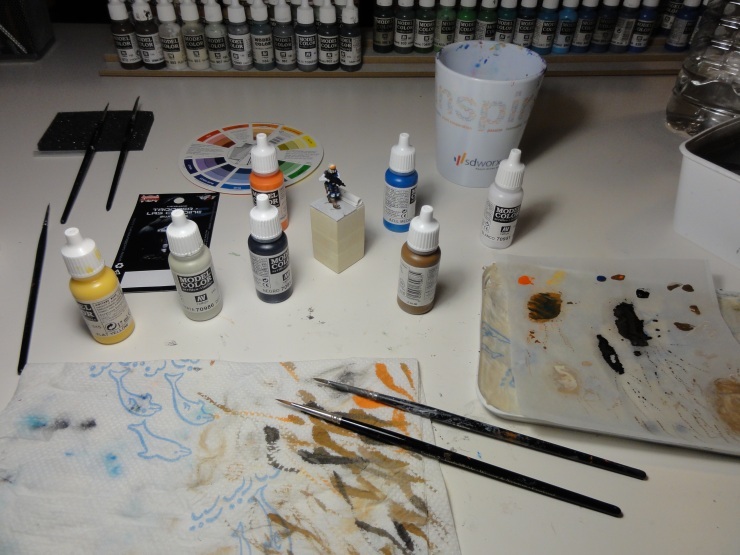 I also have a bunch of stuff lined up for this blog, but all of it needs more work: new cloud backdrops, a tutorial on Bregan's base, my opinion on the "new" Rackham minis.... stay tuned! 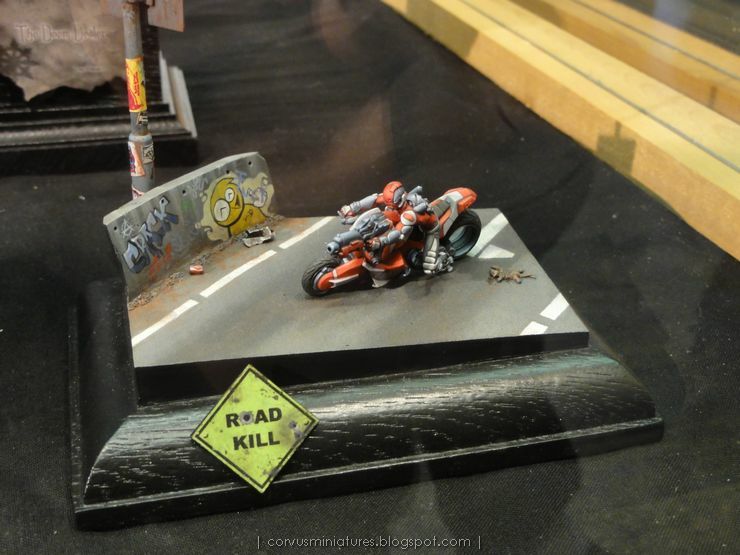 Mounted on a VoodooWorx plinth. 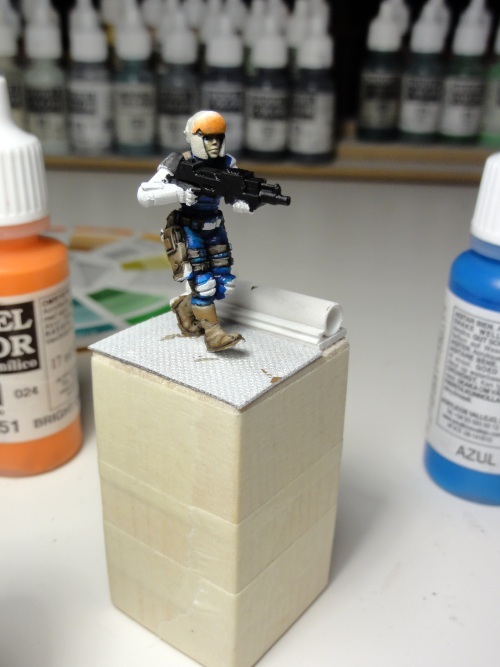 Started working on a new miniatures tonight: a Vanguard Trooper by Studio McVey. It's the first time I try out one of their figures and I'm a bit disappointed in a way. For some obscure reason the metal figure comes in 4 parts: legs, torso, head and the arms which hold a weapon. What I find strange is that the body with the head isn't one piece, and then the arms with the weapon a second part. On top of that the legs and torso don't quite fit that well. I also had to file away quite some metal on the head and neck to get a pose similar to the one on the blister. But on the other hand the sculpt is fantastic. All details are very well pronounced, quite some variation on the figure as well. 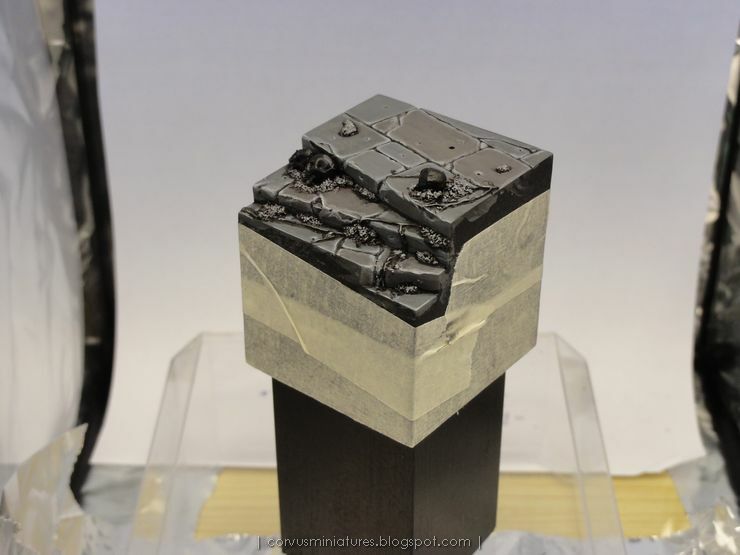 Maybe the resin version is worth the extra cost over this metal figure after all.... (assuming it's cast in less parts). This edition was the very first DUZI I visited. 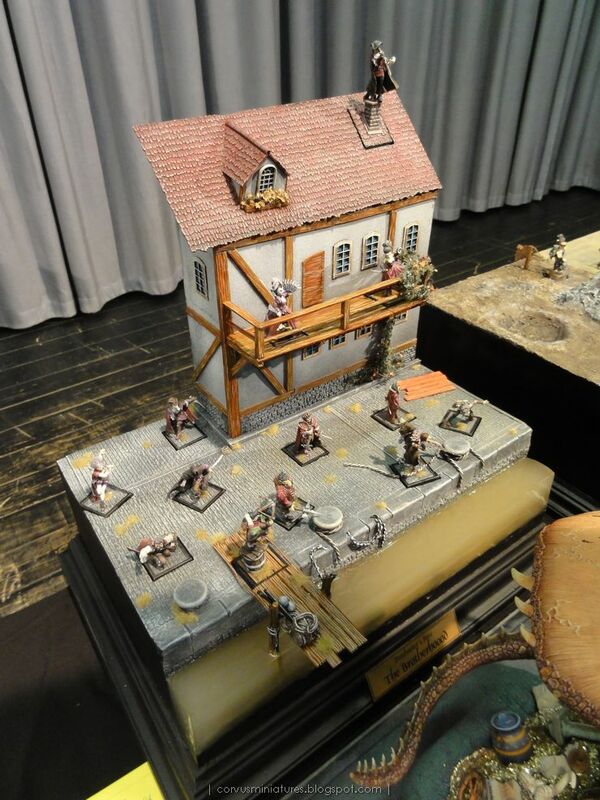 I heard a lot about the event, that it was more historical oriented in the past, but in the last few years fantasy & sf miniatures are on the rise. 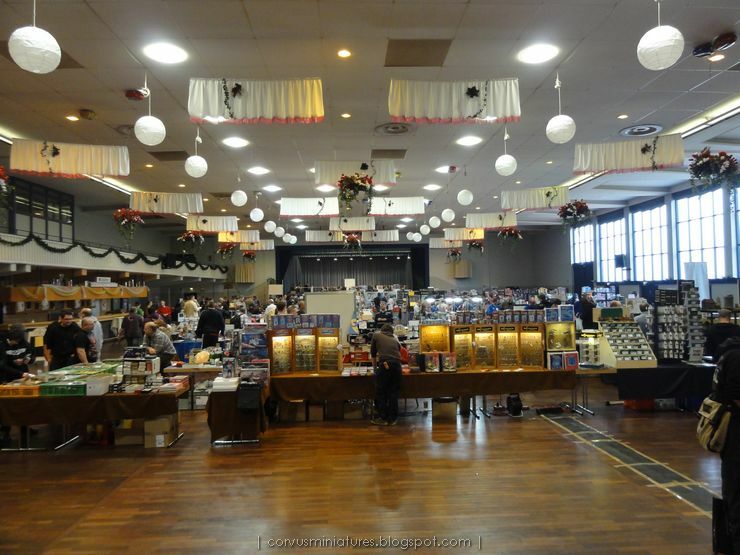 Overall it's a very nice: good location, wide selection of traders and a good painting competition. 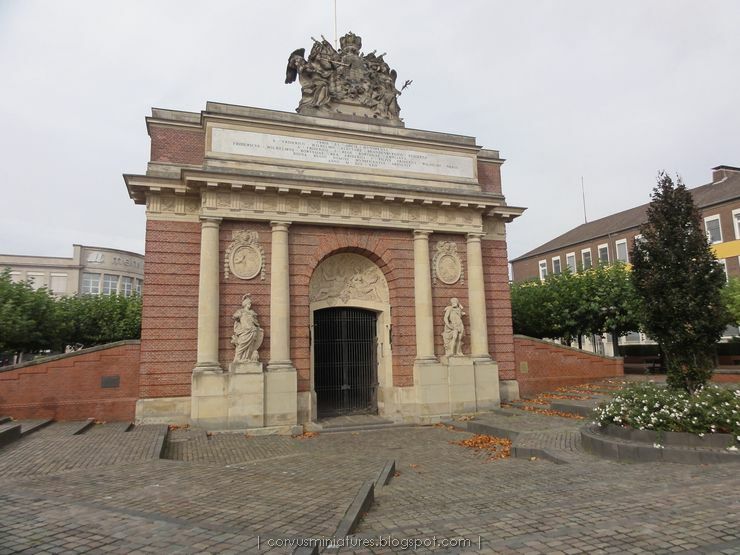 Wesel is quite close to the border, so for me the drive was only a good 2 hours. Jasper joined me for some company, and also to enter a figure into the competition. 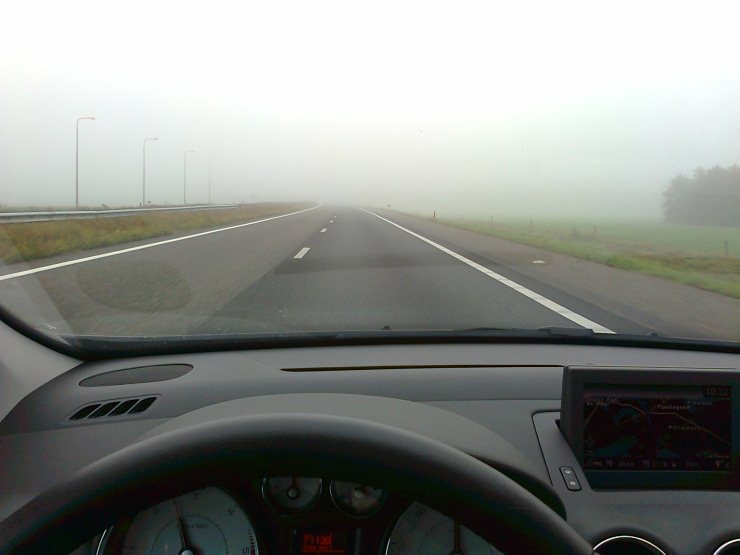 Not long into the drive we were faced with fog, but apart from that the trip was very pleasant. 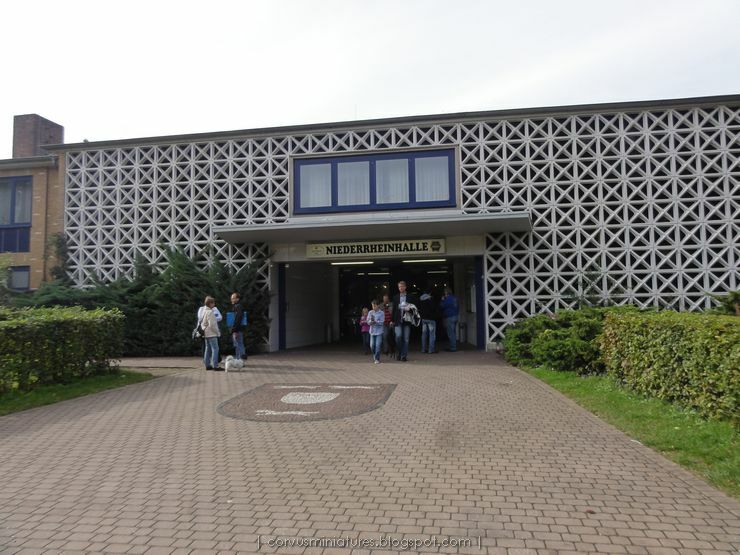 After this sight seeing we returned to the Niederrheinhalle, where the event was taking place. What did not immediately occur to me when I entered the room at first, but what I think is very striking now that I see this picture, is that it was not at all crowded. 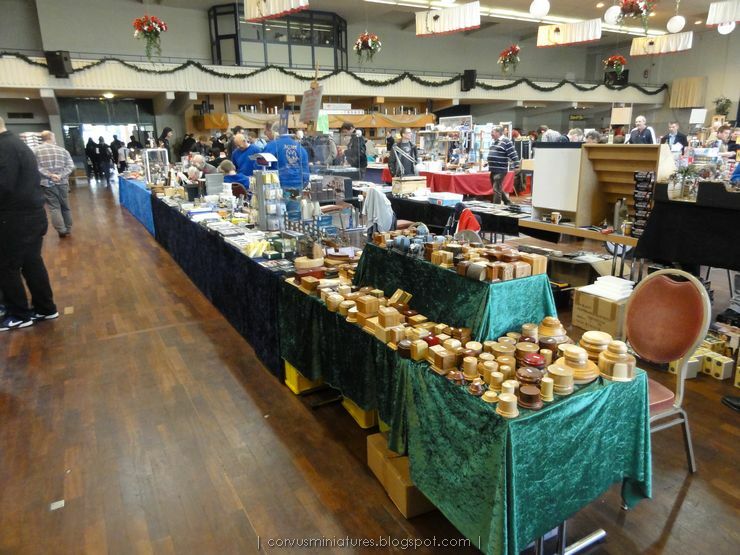 There were plenty of visitors, but when I see the pictures now it seems that there were more traders than visitors. From what I heard afterwards it was very quiet at the event with a lot less people than last year. 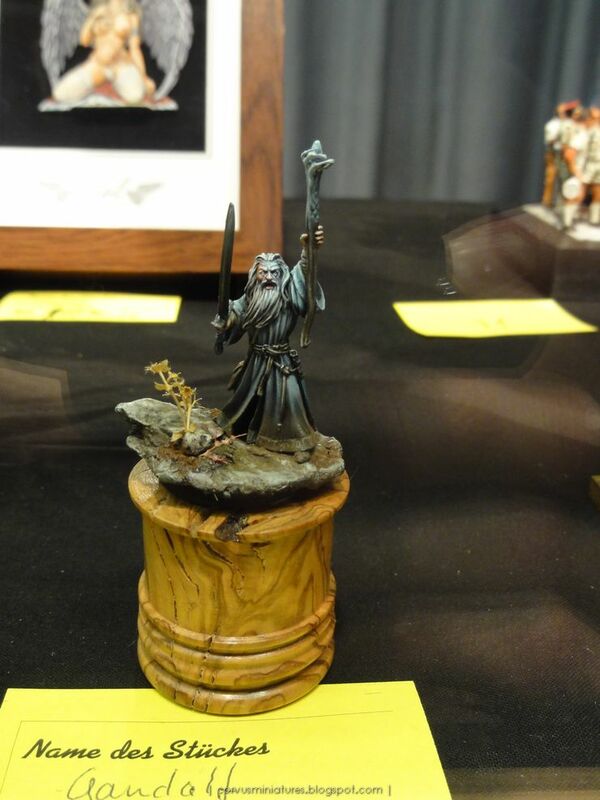 This also showed in the painting contest (more on this later). What caused this drop is unknown to me at this point, maybe bad promotion? 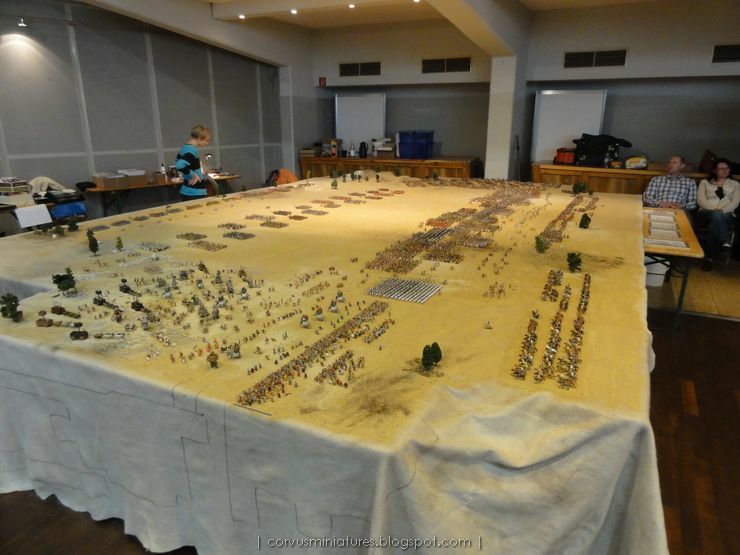 Anyway next to the entrance was this huge historical display table, with literally thousands of figures. 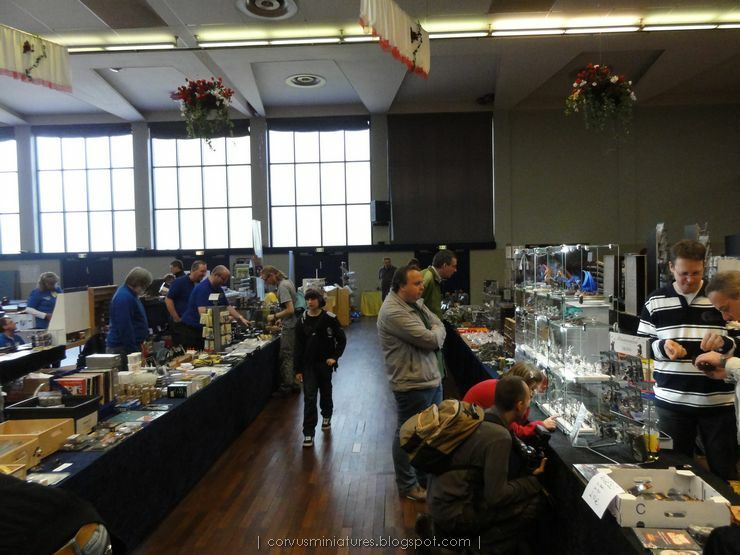 The rest of the main hall was filled with various sorts of traders, most of them focusing on the smaller scales: 28mm and 1/72. 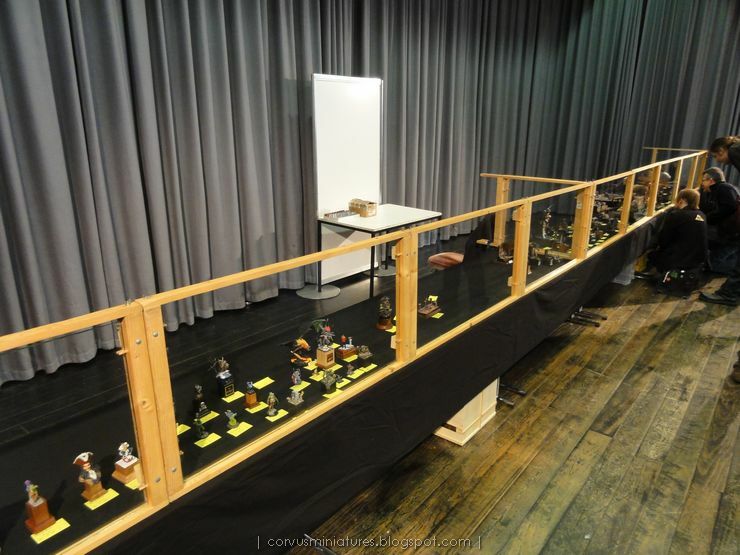 At one side of the hall is a stage where the painting competition was held. 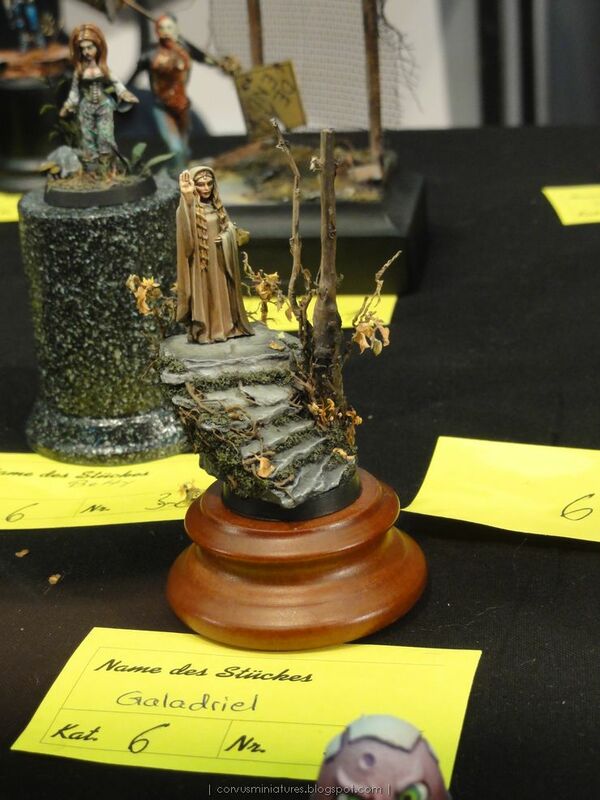 The painting competition is very well organized. 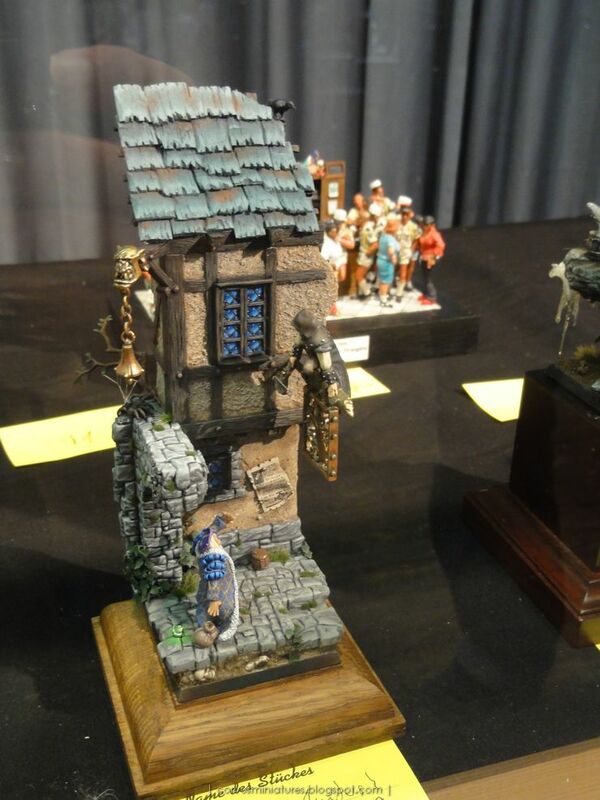 It's free and the registration process was quick and painless, you were allowed to put your own miniatures on the display. In total there were 17 categories. 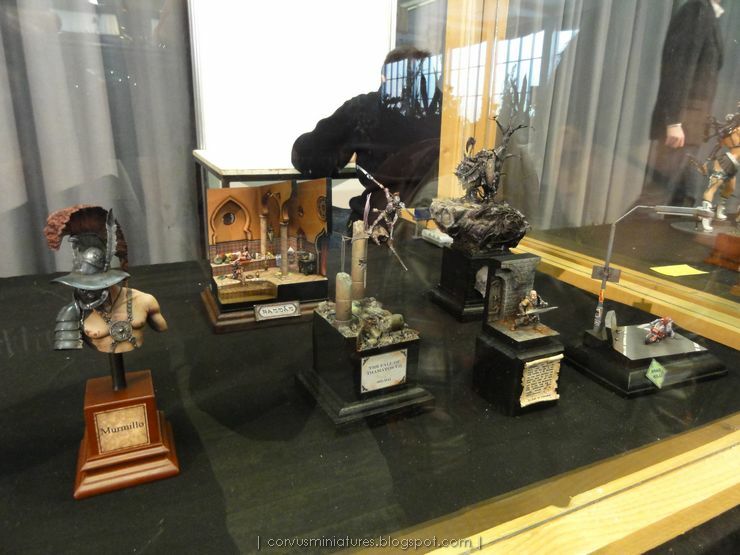 The figures were displayed behind a glass screen. This year there were almost 100 entries. From what I've heard there were about double that many entries last year. But the overall level was very good. There are three major categories: "first choice" which is the beginner category, "rising master" the regular category, and a master category. 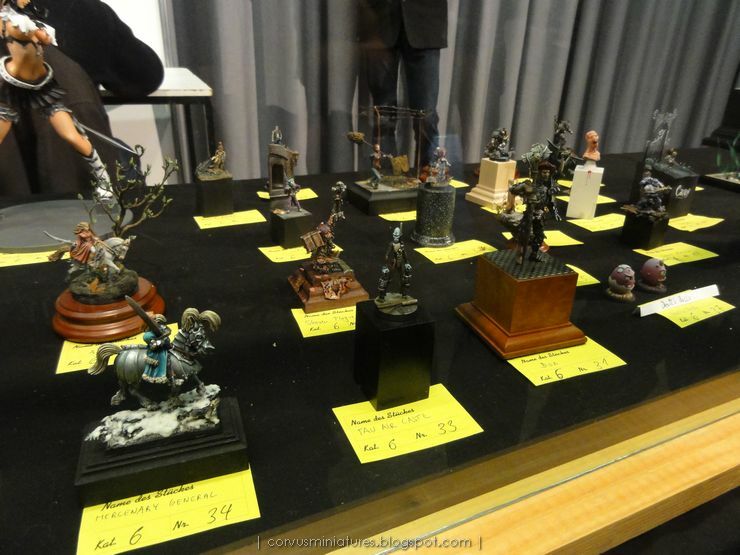 Those categories have the usual sub-categories: single mini, diorama, etc. And then there's youngbloods and a free-to-enter display category, in which the minis do not compete (a great initiative I think). Scoring was done using a points-system. In each category thresholds will be set for each prize. So it's perfectly possible to have no winners at all in one category or to have several gold medals. I decided to enter my figures in the single fantasy/sf category of "rising master", and they seemed to fit in quite well. 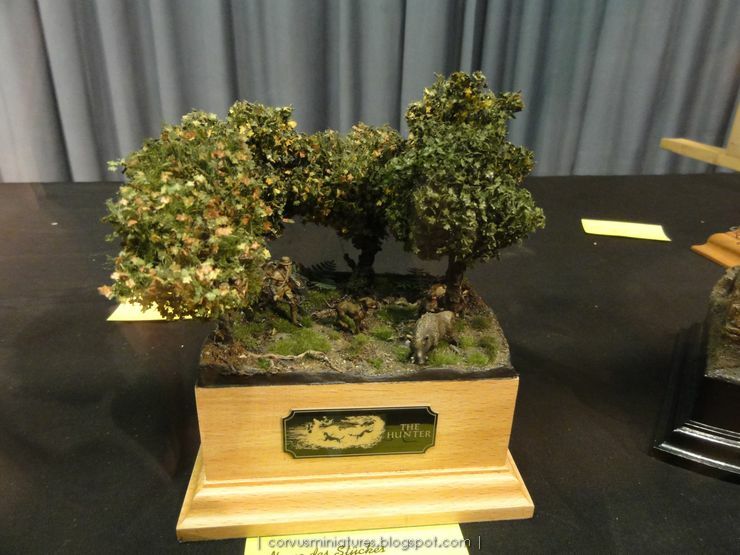 It was also the most crowded category with 25 entries. 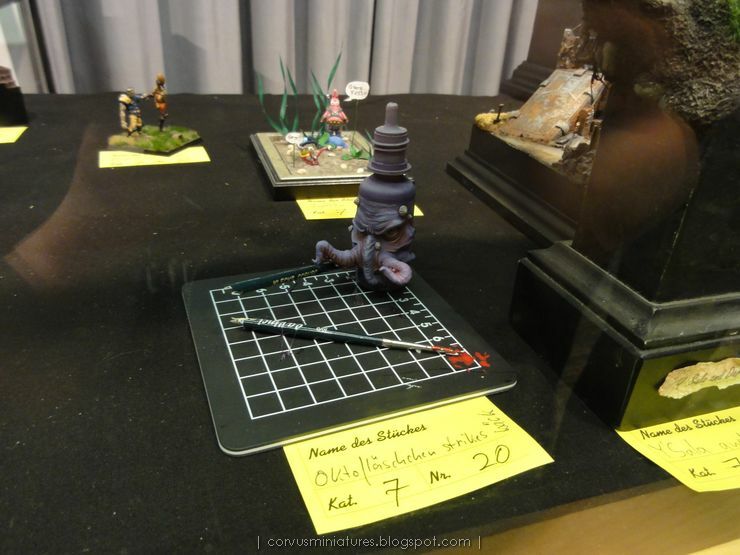 There was also a separate display section by Jürgen Wagner (aka Crackpot). Around 15:30h it was very well visible that a lot of people already went home. The shopkeepers even started packing by then. 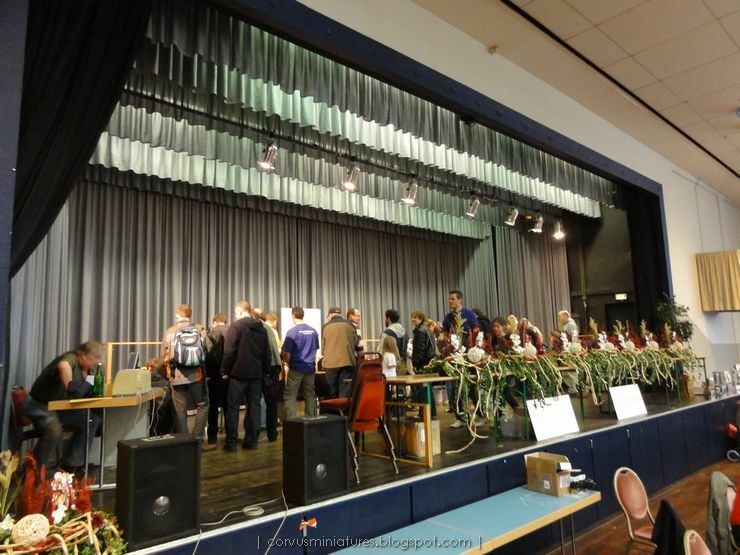 The judging of the painting competition was completed around 16h. When the winners were announced most people not taking part in the competition were already gone. The award ceremony itself was a bit lengthy and unclear to me (maybe because I hardly understand any German :), but it was great to be on stage with the other "golden DUZI" winners. I'll surely be back next year to defend my prize. DUZI is a great opportunity to do some shopping and meet people. But I sincerely hope that the crowd will be bigger next year and that there will be more entries in the painting competition.